View of the ship’s wet lab. View of the water through the galley sink porthole. 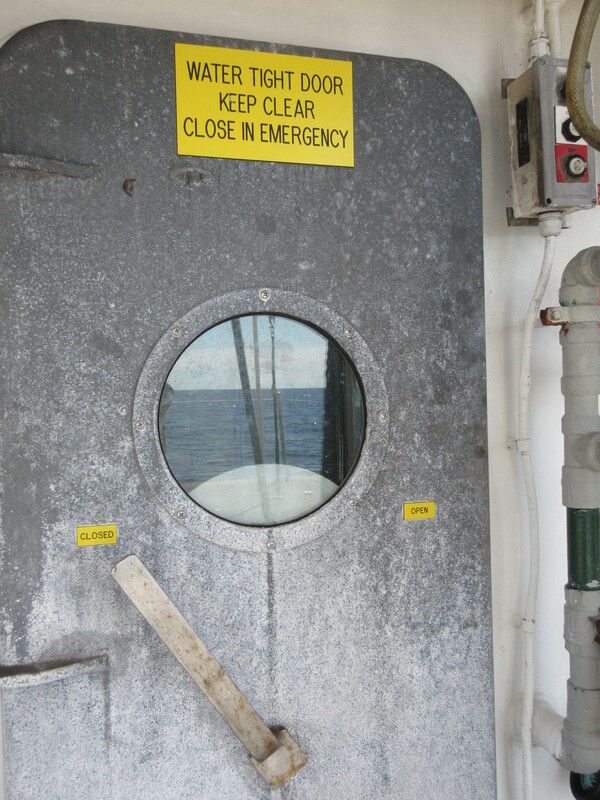 View of the water through a porthole in the galley. Participating in the Shark/Red Snapper Longline Survey provided a porthole into several different career paths. Each role on board facilitated and contributed to the scientific research being conducted. Daily longline fishing activities involved working closely with the fishermen on deck. I was in awe of their quick-thinking adaptability, as changing weather conditions or lively sharks sometimes required a minor change in plan or approach. Whether tying intricate knots in the monofilament or displaying their familiarity with the various species we caught, the adept fishermen drew upon their seafaring skill sets, allowing the set and haulback processes to go smoothly and safely. Chief Boatswain Tim Martin deploying the longline gear. I had the opportunity to speak with some of the engineers and fishermen about their onboard roles and career paths. It was interesting to learn that many career paths were not direct roads, but winding, multilayered journeys. Some joined NOAA shortly after finishing their education, while others joined after serving in other roles. Some had experience with commercial fishing, and some had served on other NOAA vessels. Many are military veterans. With a name fit for a swashbuckling novel set on the high seas, Junior Unlicensed Engineer Jack Standfast, a United States Navy veteran, explained how the various departments on board worked together. These treasured conversations with the Engineering Department and Deck Department were enlightening, a reminder that everyone has a story to tell. I very much appreciate their patience, kindness, and willingness to share their expertise and experiences. 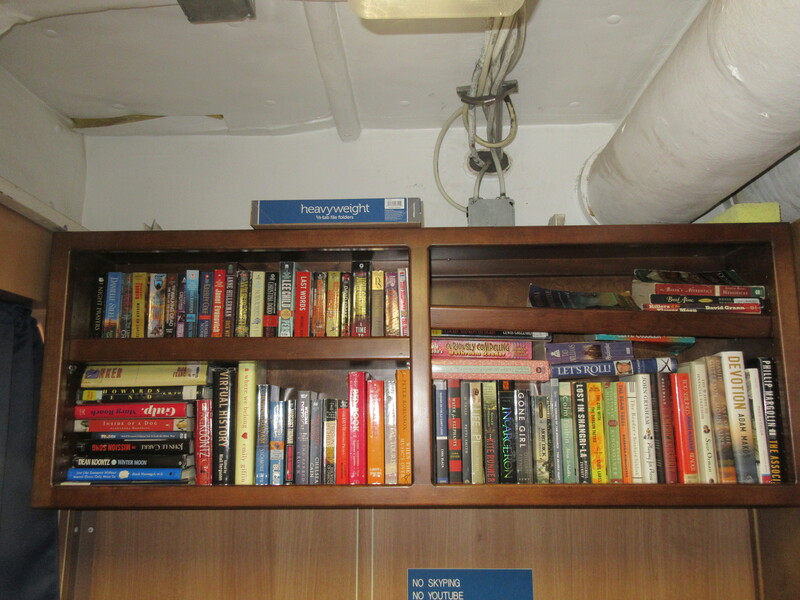 The ship had a small library of books, and several crew members mentioned reading as a favorite way to pass the time at sea. Skilled Fisherman Mike Conway shared several inspiring and philosophical websites that he enjoyed reading. In an unfamiliar setting, familiar topics surfaced in conversations, revealing similarities and common interests. Despite working in very different types of jobs, literacy was a popular subject in many of the conversations I had on the ship. I spoke to some of the crew members about how literacy factored into their daily lives and career paths. Some people described their family literacy routines at home and shared their children’s favorite bedtime stories, while others fondly remembered formative stories from their own childhood. Lead Fisherman Chris Nichols recalled the influence that Captains Courageous by Rudyard Kipling had on him as a young reader. He described how exciting stories such as Captains Courageous and The Adventures of Tom Sawyer inspired a sense of adventure and contributed to pursuing a unique career path. Coming from a family of sailors, soldiers, and adventurers, Chris conveyed the sense of pride that stems from being part of “something bigger.” In this case, a career that combines adventure, conservation, and preservation. His experiences with the United States Navy, commercial fishing, NOAA, and scuba diving have taken him around the world. 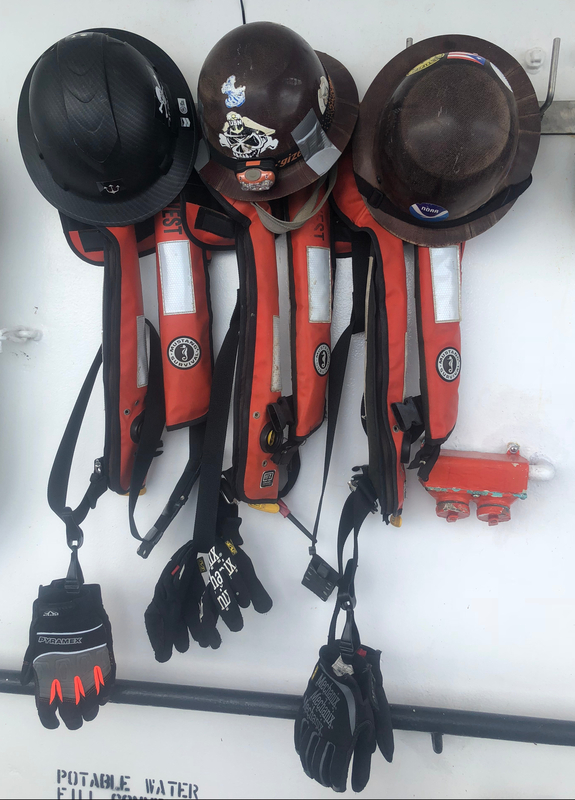 Led by Divemaster Chris Nichols, also the Oregon II’s Lead Fisherman and MedPIC (Medical Person in Charge), the team gathered on the bridge (the ship’s navigation and command center) to conduct a pre-dive operation safety briefing. Nichols appears in a white t-shirt, near center. Chris also shared some advice for students. He felt it was easier for students to become good at math and to get better at reading while younger and still in school. Later in life, the need for math may resurface outside of school: “The things you want to do later…you’ll need that math.” As students grow up to pursue interests, activities, and careers, they will most likely need math and literacy to help them reach their goals. Chris stressed that attention to detail—and paying attention to all of the details—is extremely important. Chris explained the importance of remembering the steps in a process and paying attention to the details. He illustrated the importance of knowing what to do and how to do it, whether it is in class, during training, or while learning to dive. Before joining NOAA, Skilled Fisherman Chuck Godwin served in the United States Coast Guard for fifteen years (active duty and reserves). After serving in the military, Chuck found himself working in education. While teaching as a substitute teacher, he saw an ad in the newspaper for NOAA careers and applied. 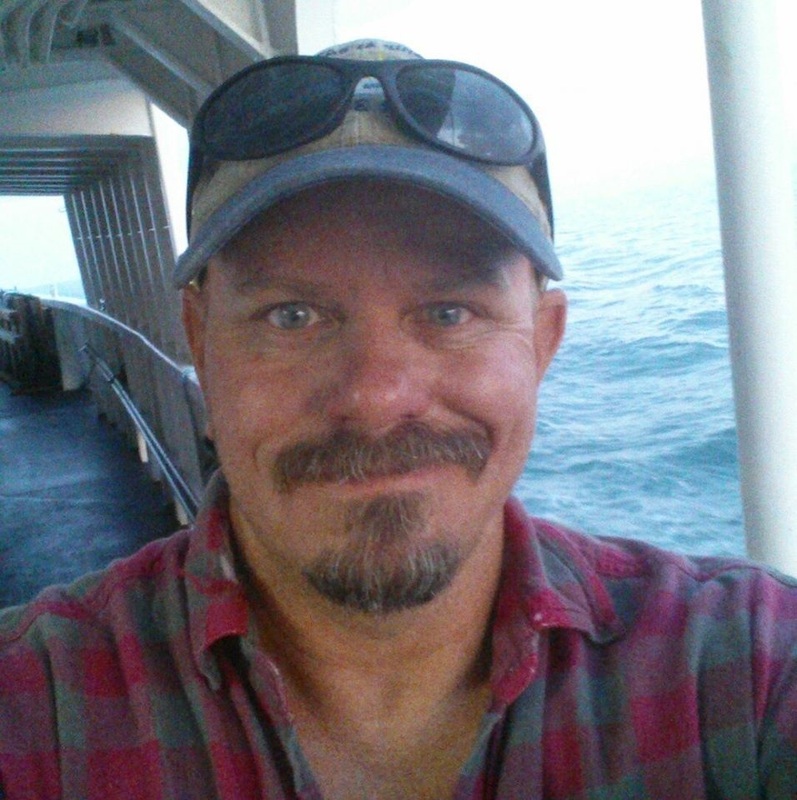 Chuck joined NOAA in 2000, and he has served on NOAA Ships Bell M. Shimada, Pisces, Gordon Gunter, and Oregon II. Echoing Chris Nichols’ description of puzzle pieces in a team, Chuck further explained the hierarchy and structure of the Deck Department on the Oregon II. 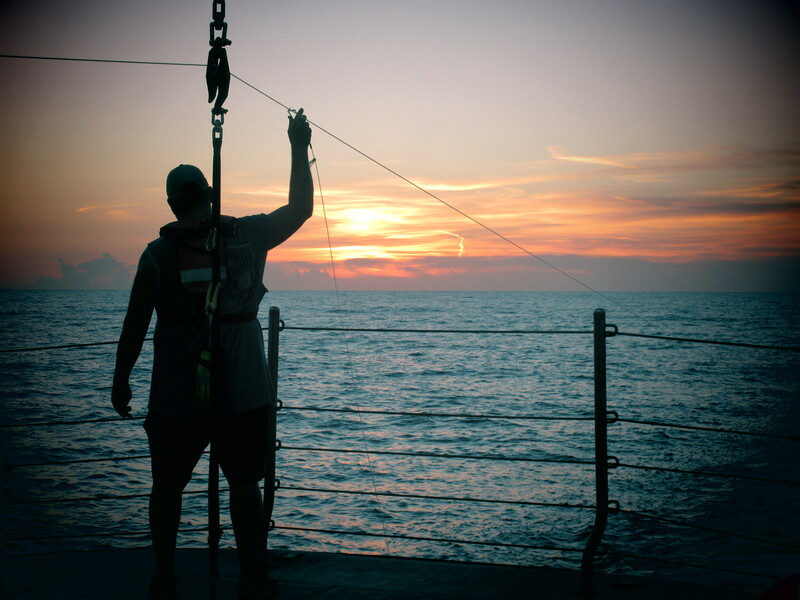 The Deck Department facilitates the scientific research by deploying and retrieving the longline fishing gear while ensuring a safe working environment. From operating the winches and cranes, to hauling in some of the larger sharks on the shark cradle, the fishermen perform a variety of tasks that require both physical and mental dexterity. Chuck explained that in the event of an unusual situation, the Deck Department leader may work with the Bridge Officer and the Science watch leader and step in as safety dictates. Skilled Fisherman Chuck Godwin. Photo courtesy of Chuck Godwin. Far from home, these brief conversations with strangers seemed almost familiar as we discussed shared interests, goals, and experiences. As I continue to search for my own tribe and sense of belonging, I will remember these puzzle pieces in my journey. A high flyer and buoy mark one end of the longline. If I encountered an animal I’d never seen in person, then the day was a victory. And I encountered many creatures I’d never seen before. Several species of sharks: silky, smooth-hound, sandbar, Atlantic sharpnose, blacknose, blacktip, great hammerhead, lemon, tiger, and bull sharks. A variety of other marine life: groupers, red snapper, hake, and blueline tilefish. Pelicans and other seabirds. Sharksuckers, eels, and barracudas. The diminutive creatures were just as interesting as the larger species we saw. Occasionally, the circle hooks and monofilament would bring up small hitchhikers from the depths. Delicate crinoids and brittle stars. Fragments of coral, scraps of seaweed and sponges, and elegant, intricate shells. 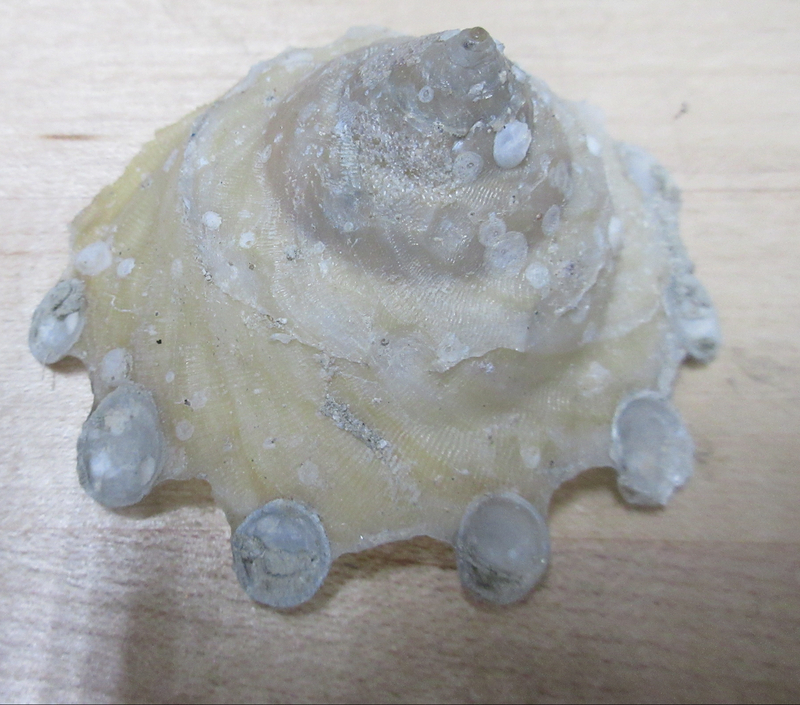 One particularly fascinating find: a carrier shell from a marine snail (genus: Xenophora) that cements fragments of shells, rocks, and coral to its own shell. The evenly spaced arrangement of shells seems like a deliberately curated, artistic effort: a tiny calcium carbonate collage or shell sculpture. These tiny hints of what’s down there were just as thrilling as seeing the largest shark because they assured me that there’s so much more to learn about the ocean. At the base of the spiral-shaped shell, the occupant had cemented other shells at regular intervals. The underside of the shell. And the sharks. The breathtaking, perfectly designed sharks. Seeing and handling creatures that I feel strongly about protecting reinforced my mission to educate, protect, and conserve. The experience reinvigorated my connection to the ocean and reiterated why I choose to reduce, reuse, and recycle. 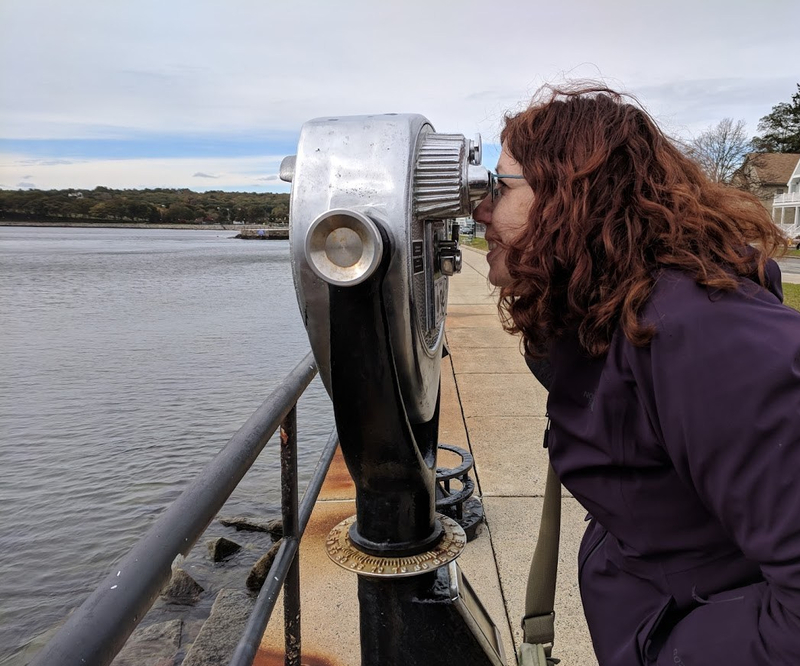 Capturing the experience through the Teacher at Sea blog reinforced my enjoyment of writing, photography, and creative pursuits. My first glimpse of Florida on the way to the ship. Participating in Teacher at Sea provided a closer view of some of my favorite things: sharks, ships, the sea, and marine science. 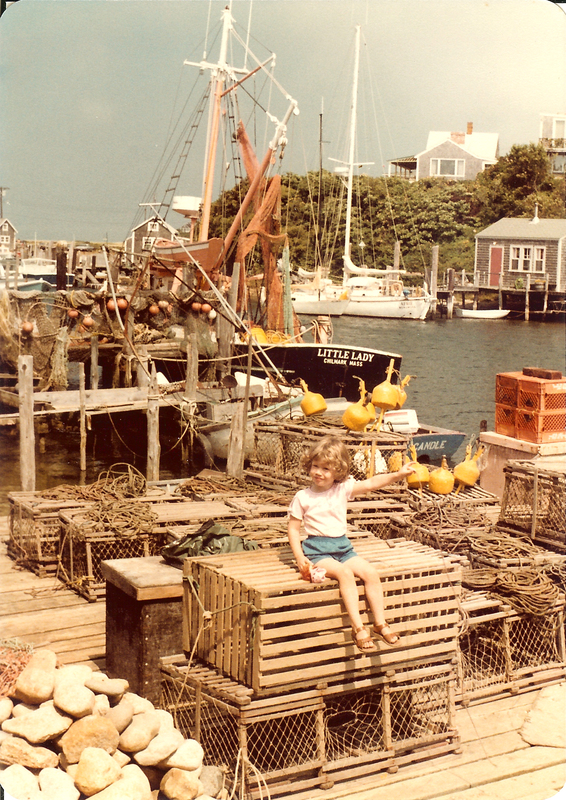 In my introductory post, I wrote about formative visits to New England as a young child. 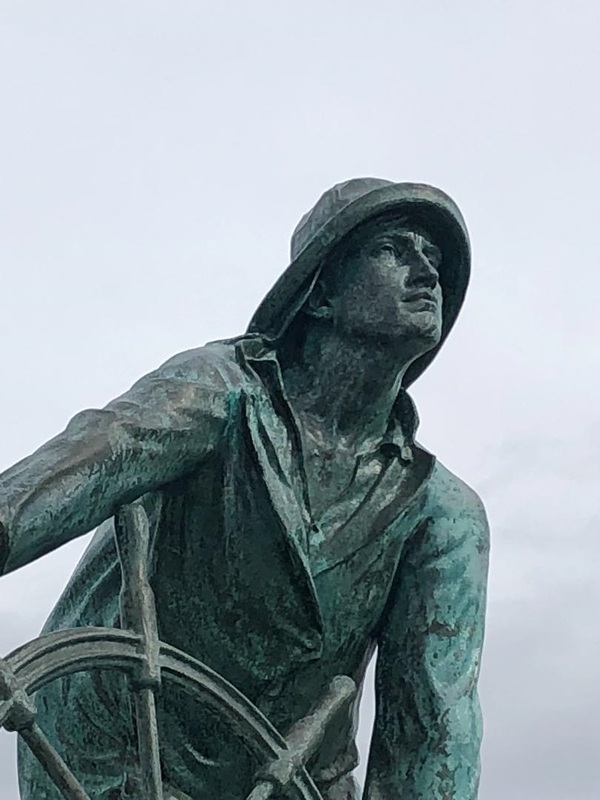 Like so many aspects of my first glimpses of the ocean and maritime life, the Gloucester Fisherman’s Memorial statue intrigued me and sparked my young imagination. 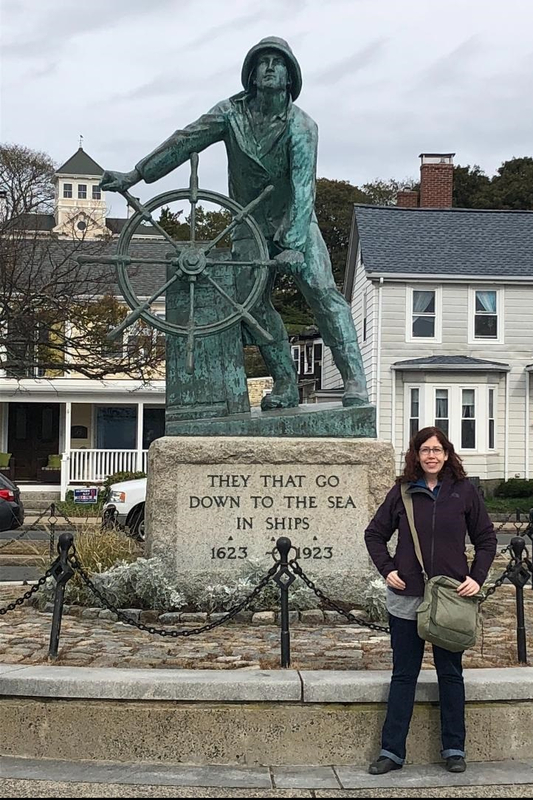 At that age, I didn’t fully grasp the solemn nature of the tribute, so the somber sculpture and memorial piqued my interest in fishing and seafaring instead. As wild as my imagination was, my preschool self could never imagine that I would someday partake in longline fishing as part of a Shark/Red Snapper Survey. My affinity for marine life and all things maritime remains just as strong today. Other than being on and around the water, docks and shipyards are some of my favorite places to explore. Living, working, and learning alongside fishermen was an honor. I was drawn to the sea at a young age. This statue inspired an interest in fishing and all things maritime. After experiencing longline fishing for myself, I revisited the statue to pay my respects. Water and its fascinating inhabitants have a great deal to teach us. The Atlantic and the Gulf of Mexico reminded me of the notion that: “Education is not the filling of a pail, but the lighting of a fire.” Whether misattributed to Plutarch or Yeats or the wisdom of the Internet, the quote conveys the interest, curiosity, and appreciation I hope to spark in others as I continue to share my experience with my students, colleagues, and the wider community. I am very grateful for the opportunity to participate in Teacher at Sea, and I am also grateful to those who ignited a fire in me along the way. Thank you to those who supported my journey and adventure. I greatly appreciate your encouragement, support, interest, and positive feedback. Thank you for following my adventure! Thank you to NOAA Ship Oregon II and Teacher at Sea! The sun shines on NOAA Ship Oregon II. 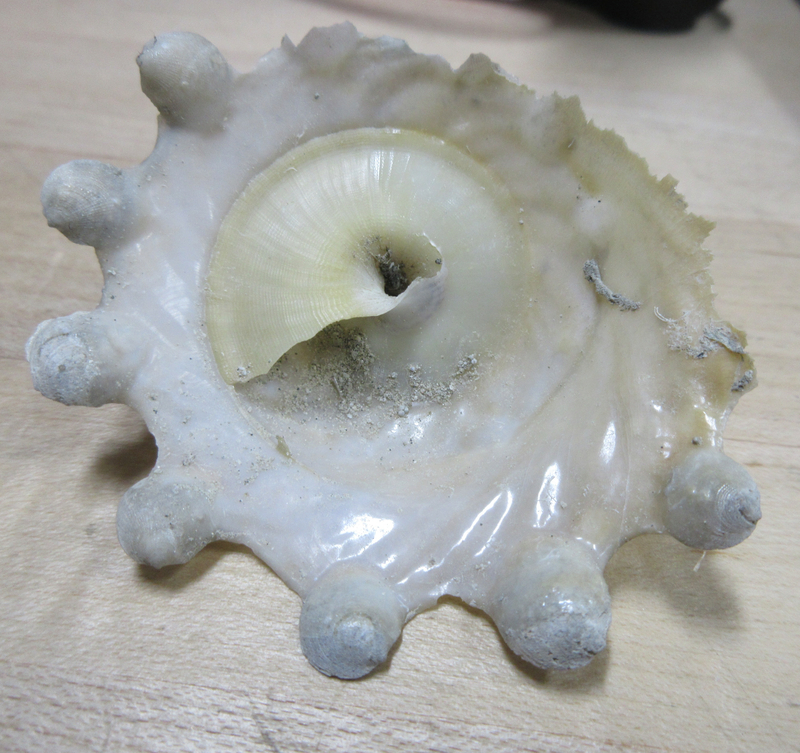 Xenophora shells grow in a spiral, and different species tend to collect different items. The purpose of self-decoration is to provide camouflage and protection from predators. The additional items can also strengthen the snail’s shell and provide more surface area to prevent the snail from sinking into the soft substrate. 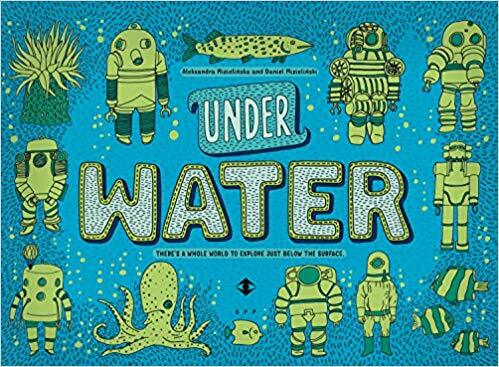 Essentially two books in one, I recommend the fact-filled Under Water, Under Earth written and illustrated by Aleksandra Mizielinska and Daniel Mizielinski. The text was translated from Polish by Antonia Lloyd-Jones. One half of the book burrows into the Earth, exploring terrestrial topics such as caves, paleontology, tectonic plates, and mining. Municipal matters such as underground utilities, water, natural gas, sewage, and subways are included. 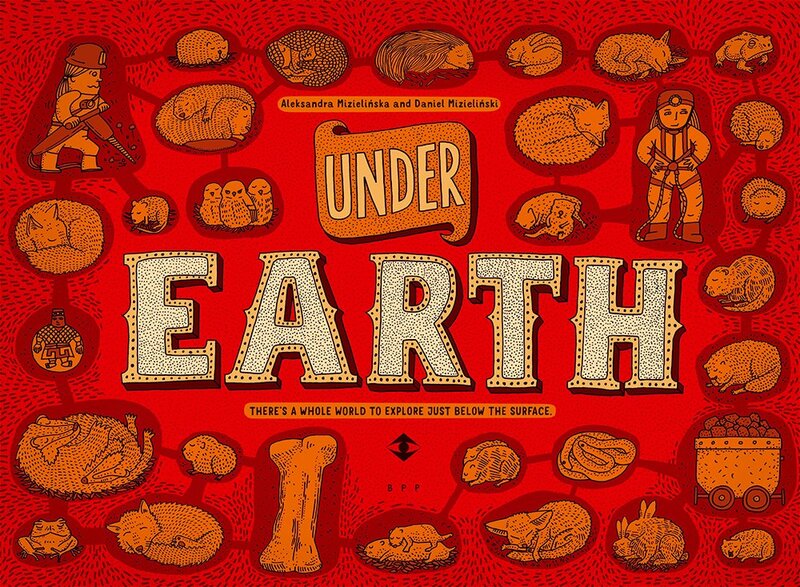 Under Earth is a modern, nonfiction, and vividly illustrated Journey to the Center of the Earth. Diving deeper, Under Water explores buoyancy, pressure, marine life, ocean exploration, and several other subjects. My favorite pages discuss diving feats while highlighting a history of diving innovations, including early diving suit designs and recent atmospheric diving systems (ADS). While Under Earth covers more practical topics, Under Water elicits pure wonder, much like the depths themselves. Better suited for older, more independent readers (or enjoyed as a shared text), the engaging illustrations and interesting facts are easily devoured by curious children (and adults!). Fun-fact finders and trivia collectors will enjoy learning more about earth science and oceanography. Information is communicated through labels, cross sections, cutaway diagrams, and sequenced explanations. Why do sharks eat fish? How and why do sharks have so many teeth? Why do sharks have different kinds of teeth? Do sharks eat each other? What hunts sharks, besides other sharks? And one of my favorite student questions: Why do sharks eat regular people, but not scientists? Circle hooks are used in longline fishing. Each hook is baited with mackerel (Scomber scombrus). Frozen mackerel (Scomber scombrus) is used as bait. The circle hooks and gangions are stored in barrels. The hooks are attached to thick, plastic fishing line called monofilament. All 100 circle hooks were baited with mackerel, but sharks also eat a variety of other fish. The sharks we caught through longline fishing methods were attracted to the Atlantic mackerel (Scomber scombrus) that we used as bait. Depending on the species of shark and its diet, shark teeth can come in dozens of different shapes and sizes. Instead of just two sets of teeth like we have, a shark has many rows of teeth. Each series is known as a tooth file. As its teeth fall out, the shark will continually grow and replace teeth throughout its lifetime—a “conveyor belt” of new teeth. Some sharks have 5 rows of teeth, while the bull shark (Carcharhinus leucas) may have as many as 50 rows of teeth! The sandbar shark (Carcharhinus plumbeus) usually has about 14 rows of teeth. They may lose teeth every ten days or so, and most sharks typically lose at least one tooth a week. Why? Their teeth may get stuck in their prey, which can be tough and bony. When you don’t have hands, and need to explore the world with your mouth, it’s easy to lose or break a tooth now and then. Throughout its lifetime, a shark may go through over 30,000 teeth. The shark tooth fairy must be very busy! Similar to our dining utensils, sharks’ teeth are designed for cutting, spearing, and/or crushing. The tooth shape depends upon the shark’s diet. Sharks’ teeth are not uniform (exactly the same), so the size and shape of the teeth vary, depending on their location in the upper and lower jaws. Some sharks have long, angled, and pointed teeth for piercing and spearing their food. Similar to a fork, this ensures that their slippery meals don’t escape. Other sharks and rays have strong, flattened teeth for crushing the hard shells of their prey. These teeth work like a nutcracker or shellfish-cracking tool. Still others, like the famously fierce-looking teeth of the great white, are triangular and serrated. Like a steak knife, these teeth are used for tearing, sawing, and cutting into their prey. Beyond their teeth, other body features contribute to a shark’s ability to bite, crush, pursue, or ambush their prey. The powerful muscles that control their jaws and swimming ability, the position of their mouth, and the shape of their caudal (tail) fin all influence how a shark gets its food. Unlike humans, sharks do not chew their food. They swallow their food whole, or use their teeth to rip, shred, crush, and tear their food into smaller chunks that the shark can swallow. No need to floss or brush after a meal: sharks’ teeth contain fluoride, which helps to prevent cavities and decay. Some people may find it hard to swallow the idea that sharks aren’t mindless menaces, but shark encounters are quite rare. Sharks have many extraordinary adaptations that make them efficient swimmers and hunters of other marine life, not humans. Whenever sharks come up in conversation, I am careful to dispel myths about these captivating creatures, trying to replace fear with facts (and hopefully, curiosity and respect). Since sharks can’t talk, I’m happy to advocate for them. Despite the way sharks are negatively portrayed in the media, I assure my students that sharks far prefer to eat bony fish, smaller sharks, skates, rays, octopus, squid, bivalves, crustaceans, marine mammals, plankton, and other marine life over humans. Instead of fear, I try to instill awareness of the vital role sharks fulfill in the ecosystem. We are a far greater threat to them, and they require our respect and protection. As storms and hurricanes tear across the Gulf of Mexico, causing destruction and devastation, my thoughts are with the impacted areas. Before my Teacher at Sea placement, I never thought I’d spend time in the region, so it’s interesting to see now-familiar locations on the news and weather maps. 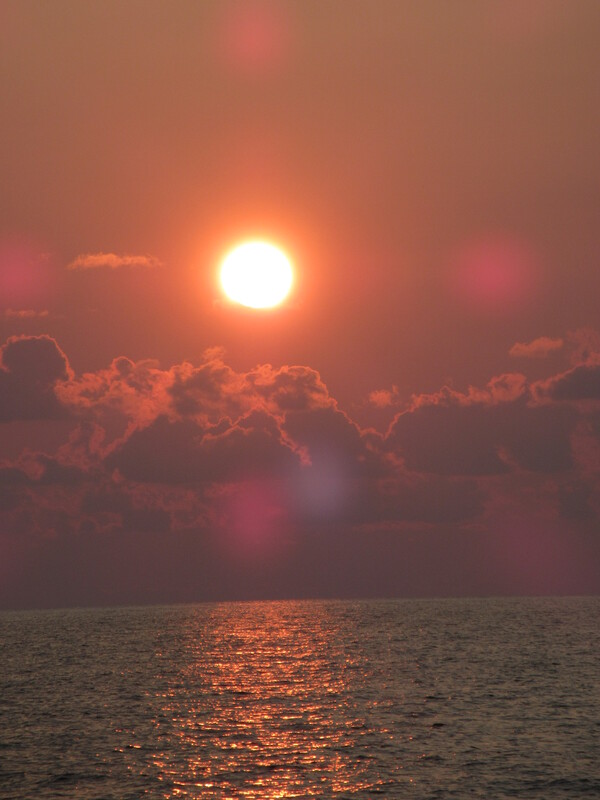 One of my favorite aspects of being at sea was watching the sky: recognizing constellations while fishing at night, gazing at glorious, melting sunsets, and observing storm clouds gathering in the distance. The colors and clouds were ever-changing, a reminder of the dynamic power of nature. Storm clouds gathered over Tampa, Florida. The clouds clustered around Tampa. The city looked very small on the horizon. As the rain started, the clouds darkened. The colors changed and darkened as lightning started in the distance. Dramatic dark clouds and lightning. Watching the recent storm coverage on TV reinforced the importance of strong and accurate communication skills. Similar to a sidebar on the page, much of the supplementary storm information was printed on the screen. For someone who needed to evacuate quickly or was worried about loved ones in the area, this printed information could be crucial. As I listened to the reporters’ updates on the storm damage, aware that they were most likely reading from scripted notes, I was reminded of the challenge of conveying complex science through everyday language. The top image from Google Maps shows one research station where we were longline fishing in August (marked in red). The bottom satellite image shows Hurricane Michael moving through the same area. Image credits: Map of the Gulf of Mexico. Google Maps, 17 August 2018, maps.google.com; satellite image: NOAA via Associated Press. 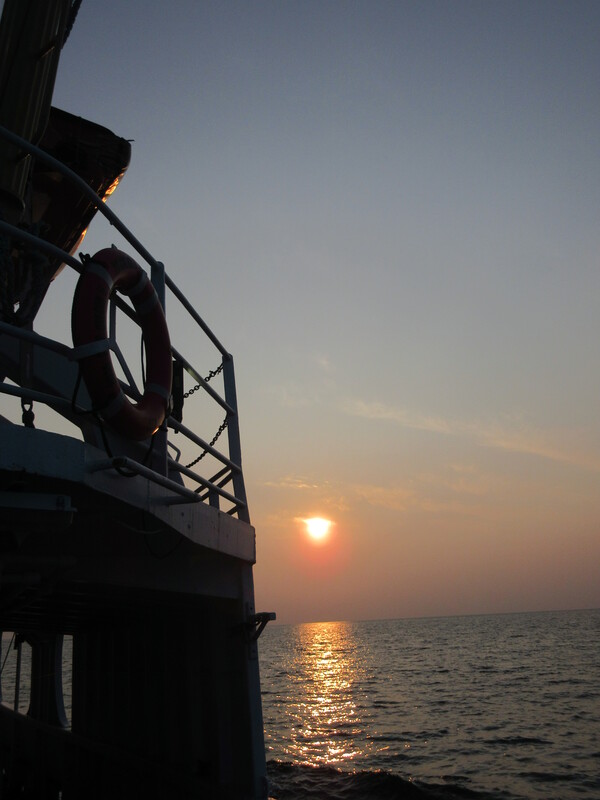 One might assume that a typical day at sea only focused on science, technology, and math. In fact, all school subjects surfaced at some point in my experience at sea. For example, an understanding of geography helped me to understand where we were sailing and how our location influenced the type of wildlife we were seeing. People who were more familiar with the Gulf of Mexico shared some facts about the cultural, economic, and historical significance of certain locations, shedding light on our relationship with water. Fishing is an old practice steeped in tradition, but throughout the ship, modern navigation equipment made it possible to fish more efficiently by plotting our locations while avoiding hazards such as natural formations and other vessels. Feats of engineering provided speed, power, drinkable water, and technological conveniences such as GPS, air conditioning, and Wi-Fi. In contrast to the natural evolution of sharks, these artificial adaptations provided many advantages at sea. To utilize the modern technology, however, literacy was required to input data and interpret the information on the dozens of monitors on board. Literacy and strong communication skills were required to understand and convey data to others. Reading and critical thinking allowed us to interpret maps and data, understand charts and graphs, and access news articles about the red tide we encountered. I witnessed almost every person on board applying literacy skills throughout their day. Whether they were reading and understanding crucial written communication, reading instructions, selecting a dinner option from the menu, or referencing a field guide, they were applying reading strategies. In the offices and work spaces on board, there was no shortage of instructional manuals, safe operating procedures, informational binders, or wildlife field guides. Writing helped to organize important tasks and schedules. To manage and organize daily tasks and responsibilities, many people utilized sticky notes and checklists. Computer and typing skills were also important. Some people were inputting data, writing research papers and projects, sharing their work through social media, or simply responding to work-related emails. The dive operation that I observed started as a thoroughly written dive plan. All of these tasks required clear and accurate written communication. Junior Unlicensed Engineer (JUE) Jack Standfast carried a small notebook in his pocket, recording the various engineering tasks he’d completed throughout the day. Each day, I saw real-life examples of the strong ties between science and language arts. Recording accurate scientific data required measurement, weight, and observational skills, but literacy was required to read and interpret the data recording sheets. Neat handwriting and careful letter spacing were important for recording accurate data, reinforcing why we practice these skills in school. To ensure that a species was correctly identified and recorded, spelling could be an important factor. Throughout the experience, writing was essential for taking interview notes and brainstorming blog ideas, as well as following the writing process for my blog posts. If I had any energy left at the end of my day (usually around 2:00 AM), I consulted one of my shark field guides to read more about the intriguing species we saw. No need for a teething ring: Sharks begin shedding their teeth before they are even born. Shark pups (baby sharks) are born with complete sets of teeth. Sharks aren’t mammals, so they don’t rely upon their mothers for food after they’re born. They swim away and must fend for themselves, so those born-to-bite teeth come in handy. Appropriate for older readers, the clever, comprehensive text offers interesting facts, tidbits, and trivia. The book dives a bit deeper to go beyond basic shark facts and knowledge. I’ve read hundreds of shark books, and I appreciated learning something new. The text doesn’t shy away from scientific terminology and concepts, such as phylogeny (eight orders of sharks and representative species). The facts reflect recent research findings on shark behavior. Lesser-known species are included, highlighting the diversity in body shapes, sizes, and specialized features. From a design standpoint, the aesthetically appealing illustrations are stylized, colorful, and engaging. Simple infographics provide explanations of complex ideas. Fact meets fiction in a section about shark mythology from around the world. The book concludes with a discussion of threats to sharks, as well as ocean conservation tips. The idea of placing an elementary school teacher on a Shark/Red Snapper Longline Survey seems like a reality show premise, and I couldn’t believe that it was my surreal reality. Several times a day, I took a moment to appreciate my surroundings and the amazing opportunity to get so close to my favorite creatures: sharks! Anyone who knows me is aware of my obsession with sharks. Seeing several sharks up close was a hallowed, reverential experience. Reading about sharks, studying them through coursework, and seeing them on TV or in an aquarium is one thing. Being only a few feet away from a large tiger shark (Galeocerdo cuvier) or a great hammerhead (Sphyrna mokarran) is quite another. Seeing the sharks briefly out of the water provided a quick glimpse of their sinewy, efficient design…truly a natural work of art. Regardless of size, shape, or species, the sharks were powerful, feisty, and awe-inspiring. The diversity in design is what makes sharks so fascinating! Even just a quick peek of this tiger shark (Galeocerdo cuvier) reveals her strong muscles and powerful, flexible design. This female tiger shark was large enough to require the shark cradle. The reinforced netting on the cradle provided support for the 10.5 foot shark. The shape of this sandbar shark’s (Carcharhinus plumbeus) head and eye is quite different from the tiger shark’s distinct design. 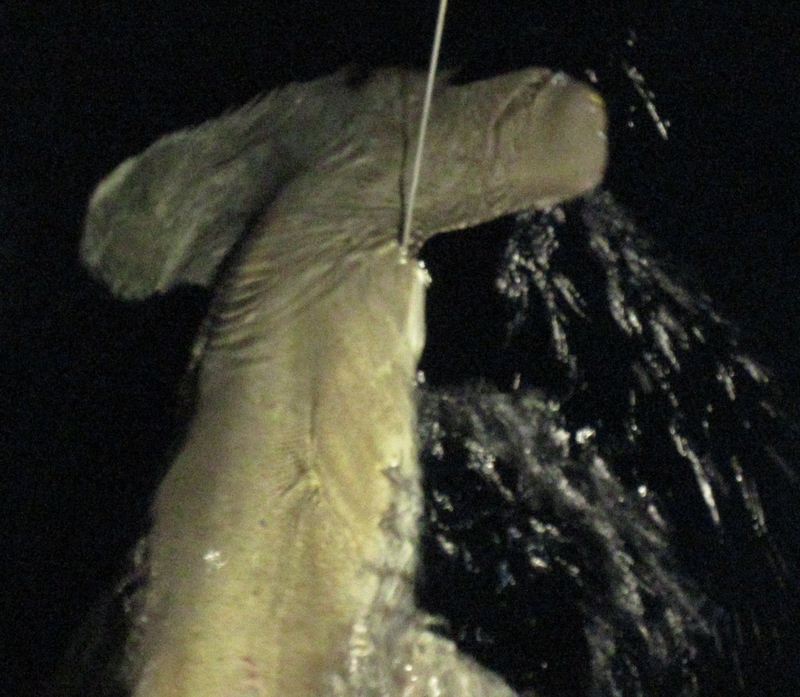 Even in the dark, the shape of the great hammerhead’s (Sphyrna mokarran) cephalofoil is unmistakable. Sadly for my curiosity, sharks have yet to acquire the ability to communicate verbally, despite their many advantageous adaptations over millions of years. To catch a glimpse of their actions in their watery world, scientists sometimes attach cameras to their fins or enlist the help of autonomous underwater vehicles (AUVs) to learn more. The secret lives of sharks… reality TV at its finest. How deep can sharks swim? How big can sharks get? How old can sharks get? Do sharks sleep? Do sharks stop swimming when they sleep? Can sharks ever stop swimming? Do sharks have friends? Do sharks hunt cooperatively or alone? The answers vary by species, but an individual shark can reveal quite a bit of information about shark biology and behavior. Tagging sharks can provide insight about migratory patterns and population distribution. This information can help us to better understand, manage, and protect shark populations. 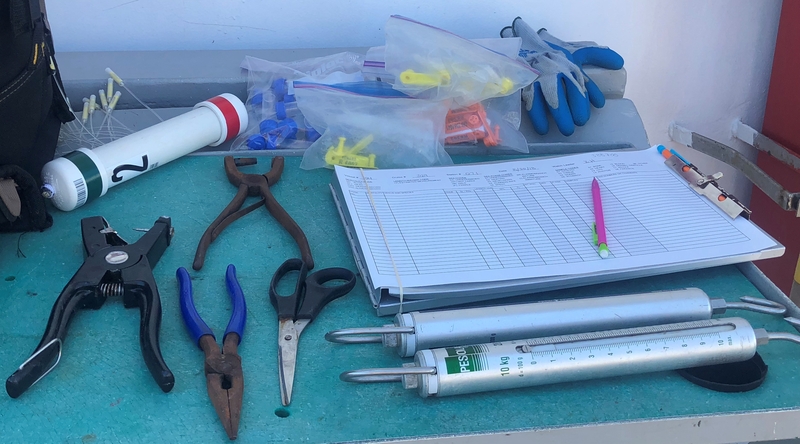 These tools are used to weigh (scales on bottom right), collect samples (scissors and vials), remove hooks (pliers, plus other instruments not pictured), apply tags (leather punch, piercing implement, and tags), and record data (clipboard and data sheet). Finally, the hook was removed from the shark’s mouth, and the shark was released back into the water (we watched carefully to make sure it swam off successfully)! 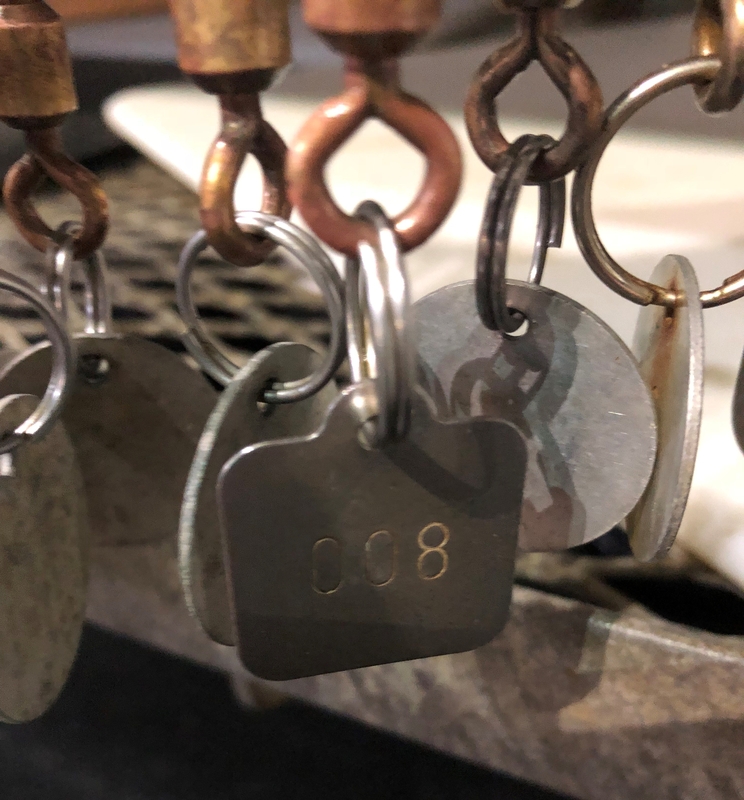 Longline fishing uses 100 numbered hooks. When a fish is caught, it’s important to record the hook number it was caught on. 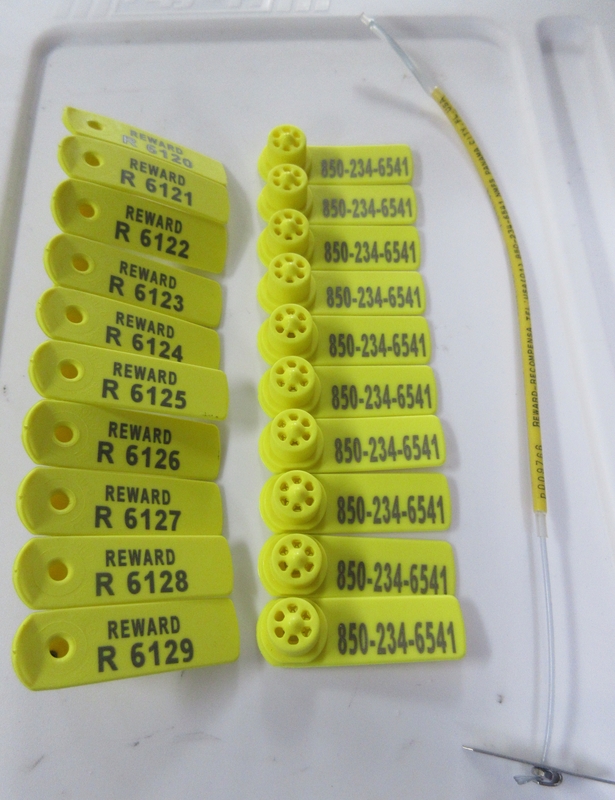 Depending on the shark’s size, we either attached a swivel tag (on left and middle, sometimes called a Rototag or fin tag; used for smaller sharks) or a dart tag (on right, sometimes called an “M” tag; used for larger sharks). • otoliths: These bony structures are found in the inner ear. Similar to tree rings, counting the annual growth rings on the otoliths can help scientists estimate the age of the fish. 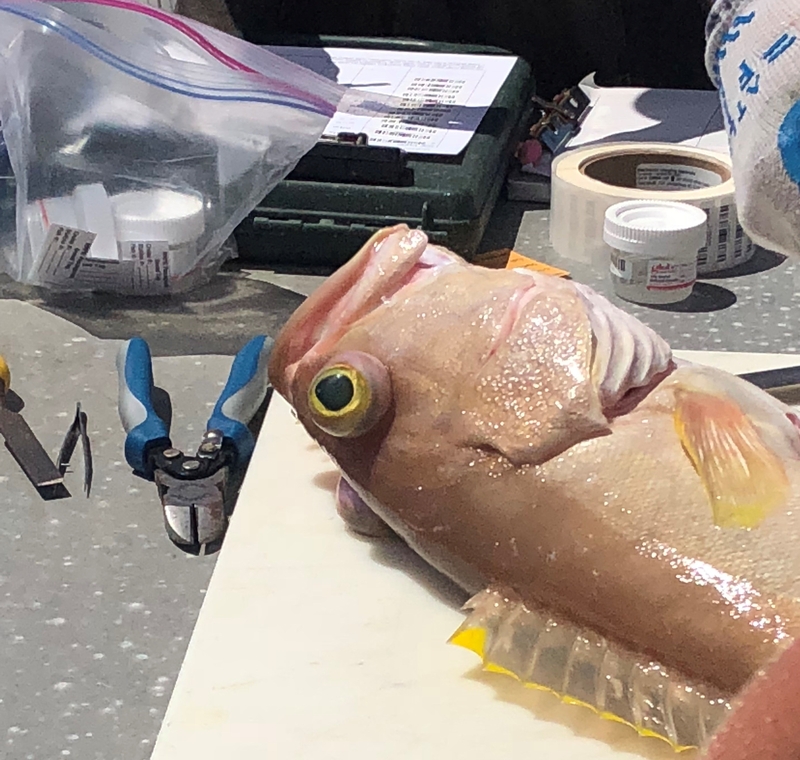 Samples were taken from this yellowedge grouper (Epinephelus flavolimbatus). Samples were preserved and stored in vials, jars, and plastic sample bags, including a Whirl-Pak. These bags and containers were carefully numbered and labeled, corresponding with the information on the data sheets. Other information was noted about the fish, including maturity and stomach contents. Sometimes, photos were taken to further document the fish. This Whirl-Pak sample bag will be used to store samples from a bony fish. To close it, the yellow tabs are held tight and the bag is whirled around until it closes. A tissue sample containing muscle from a fish was placed inside the Whirl-Pak and frozen. Later, it will be studied at a lab. Thinking of the Oregon II as my floating classroom, I looked for analogous activities that mirrored my elementary students’ school day. Many key parts of the elementary school day could be found on board. Sometimes, my students struggle to tell the time with analog clocks. The ship uses military time, so this 24-hour clock would probably cause some perplexed looks at first! We usually ate dinner between 1700-1800. 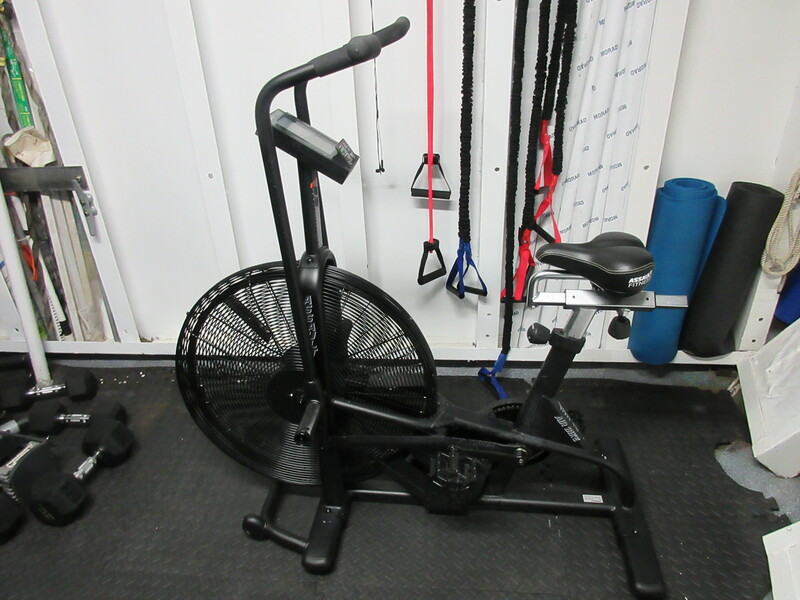 Physical Education: Fitness equipment could be found in three locations on the ship. Health: To stay energized for the twelve-hour shifts, it was important to get enough sleep, make healthy food choices, and stay hydrated. With lots of exercise, fresh air, and plenty of water, protein, and vegetables, I felt amazing. To sample some local flavors, I tried a different hot sauce or Southern-style seasoning at every meal. There wasn’t a nurse’s office, but first aid and trained medical personnel were available if needed. Some fresh paint for the ship. Fresh NOAA blue stripes echoed the sky and surrounding water. Art and music: While I was there, the ship received a fresh coat of paint. Many people on board enjoyed creative pursuits in their free time. We listened to and talked about music while deploying the longline gear. With my young readers and writers in mind, I applied my literacy lens to many of the ship’s activities. Literacy was the thread that ran through many of our daily tasks, and literacy was the cornerstone of every career on board. Several ship personnel described the written exams they’d taken to advance in their chosen careers. 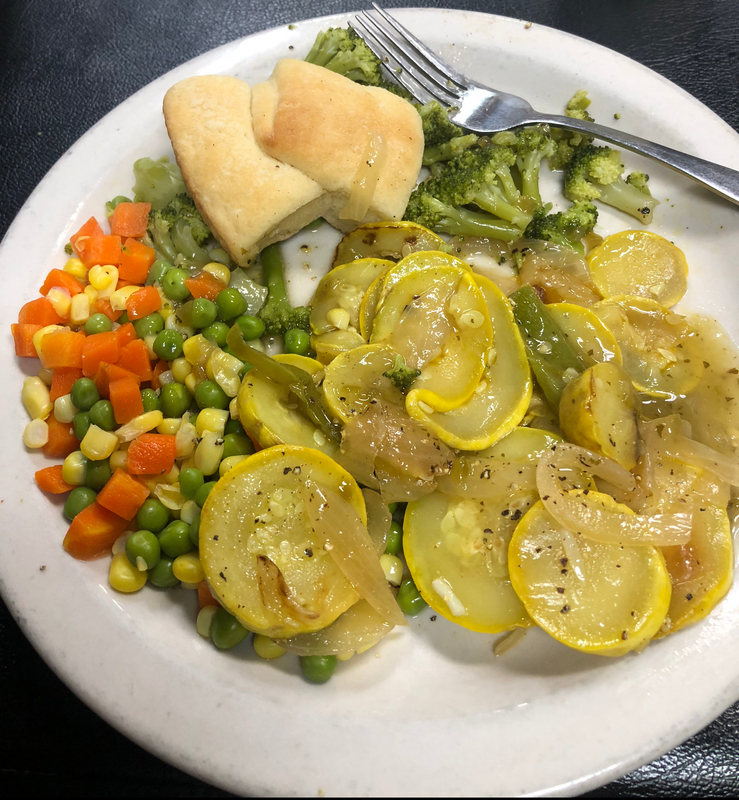 Reading and writing were used in everything from the recipes and daily menu prepared by Second Cook Arlene Beahm and Chief Steward Valerie McCaskill in the galley to the navigation logs maintained by Ensign Chelsea Parrish on the ship’s bridge. 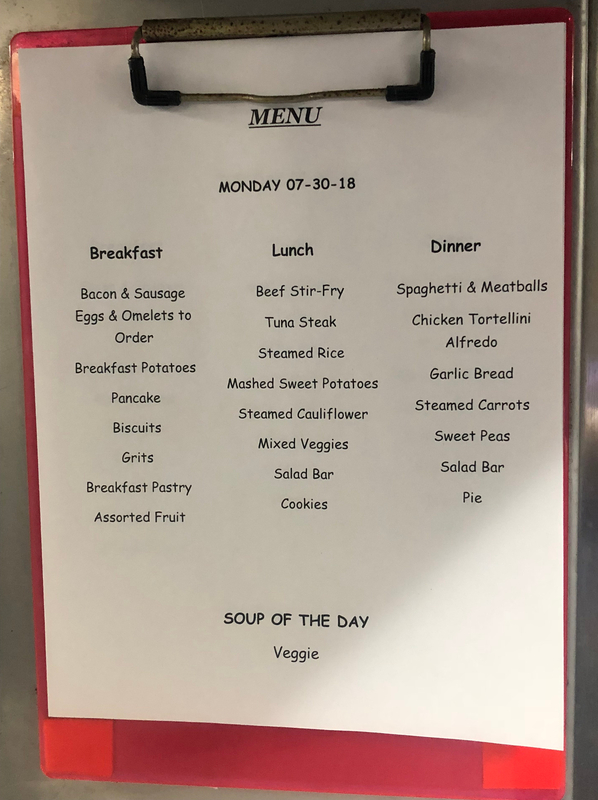 The menu changed every day. You could also make your own salad, sandwiches, and snacks. If you had to work through mealtime, you could ‘save-a-meal,’ and write down your food choices to eat later. This was kind of like indicating your lunch choice at school. Instead of a cafeteria, food was prepared and cooked in the ship’s galley. I often start the school year off with some lessons on reading and following directions. In the school setting, this is done to establish routines and expectations, as well as independence. On the ship, reading and following directions was essential for safety! 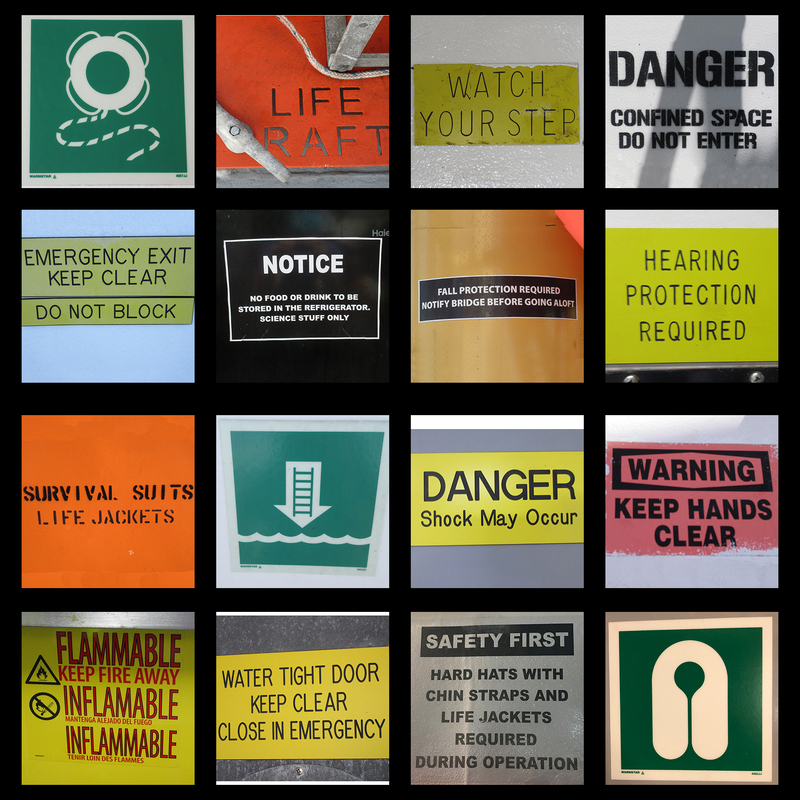 Throughout the Oregon II, I encountered lots of printed information and many safety signs. Some of the signs included pictures, but many of them did not. This made me think of my readers who rely on pictures for comprehension. Some important safety information was shared verbally during our training and safety drills, but some of it could only be accessed through reading. Without a visual aid, the reader must rely on the printed words. In this environment, skipping words, misreading words, or misunderstanding the meaning of the text could result in unsafe conditions. On a watertight door, for example, overlooking the opposite meanings of ‘open’ and ‘closed’ could have very serious consequences. Not being able to read the sign or the words ‘open’ and ‘closed’ could result in a scary situation. 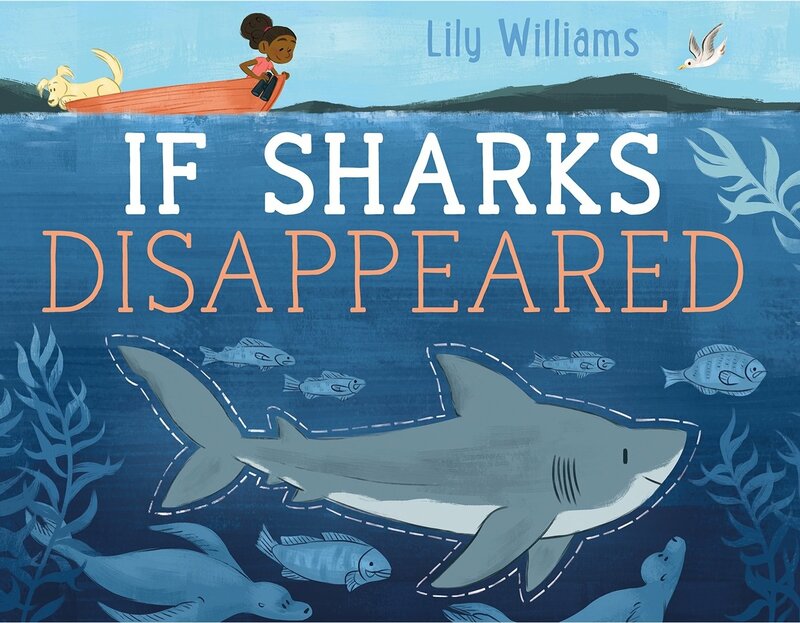 This picture book acknowledges the scariness of sharks, but explains that a world without sharks would be even scarier. Shown through the eyes of a curious young girl and her family, the book highlights the important role that sharks play in the ocean food web. As apex predators, sharks help to keep the ocean healthy and balanced. The book includes some mind-blowing facts, such as the concept that sharks existed on Earth before trees. Through easy-to-follow examples of cause and effect, the author and illustrator explores complex, sophisticated concepts such as overfishing, extinction, and trophic cascade. The glossary includes well-selected words that are important to know and understand about the environment. Additional information is provided about shark finning and ways to help save sharks. An author’s note, bibliography, and additional sources are also included. We’ve been out at sea for three full days now and have traveled along the Gulf coast from Alabama to Texas. 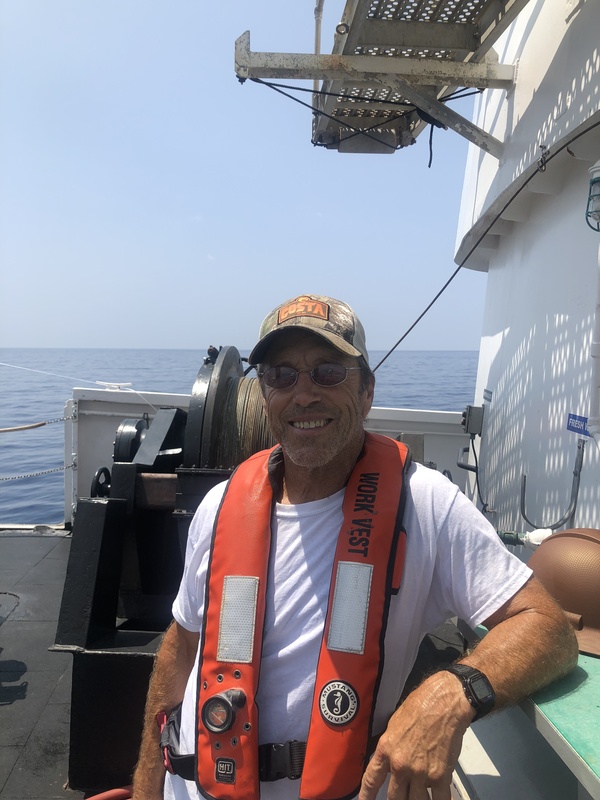 The Science Team has run mostly shallow longline sets during this time, meaning that we have fished in depths from 9 to 55 meters. As we move forward, we will fish stations at these depths and stations at depths of 55 to 183 meters, and from 183 to 366 meters. The locations of the stations are randomized based on depth and the area that is being fished. Due to the weather that hit south Texas the week before we joined this leg of the survey, we have been fishing the area that was impassable on the last leg of the survey. As a member of the science team, there are five jobs that need to be done on each side of the set. When the line is being cast, someone needs to release the highflyer, clip numbers, sling the bait, work the computer, or cleanup. When the line comes in, there is a data collector, 2 fish handlers, a hook collector, and the computer person. The highflyer is the marker that is put on either end of the line, so that the line can be seen from the bridge. The data that is collected on paper and on the computer on each fish includes the number of the hook that they are on, species, length, and gender. Additionally, some sharks are tagged and a fin clip is taken. After a line is set, we check the water using a CTD (Conductivity Temperature Depth) Probe. It has a GoPro video recorder that takes a video of the water and the sea floor at the site of the line. A few of the highlights from the catches so far: We had one catch that was coming up with mostly empty hooks, but then we caught a scalloped hammerhead shark (Sphyrna lewini). The shark was large enough that we used a cradle to pull it up to deck level. I got to insert the tag right below the dorsal fin. 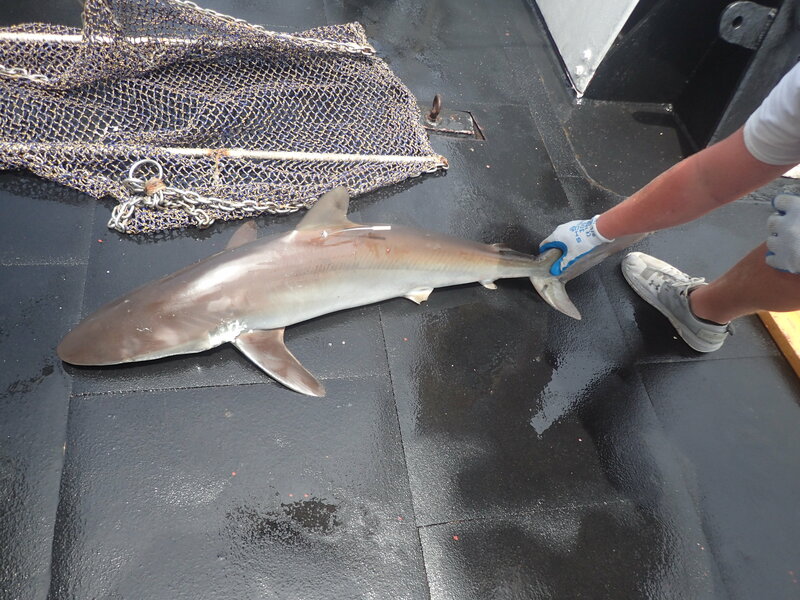 We had another survey that caught 49 sharks, including Atlantic Sharpnose Sharks (Rhizoprionodon terraenovae), Blacknose Sharks (Carcharhinus acronotus), Spinner Sharks (Carcharhinus brevipinna), and Blacktip Sharks (Carcharhinus limbatus). Between these, we had a number of lines that brought up some sharks and a few Red Snapper (Lutjanus campechanus). I have been able to dissect some of the Red Snapper, and collect their otoliths, which are their ear bones. In the time between setting and retrieving lines, one of the ways we kept ourselves busy was by cleaning shark jaws that we had collected. I look forward to using these in my classroom as an example of an apex predator species adaptation. During much the 12 hours of off time, I spend my time in my bunk. Working for 12 hours in the hot sun is exhausting, and it’s nice to have the room to myself while I try to get some rest. Though I share a bunk with another member of the Science Team, we work opposite shifts. So, while I’m on deck, she’s sleeping, and visa versa. As you can see, my daughter sent me with her shark doll, which I thought was appropriate, given that I was taking part in shark research on this ship. While we were going slow one day, we had a pod of dolphins who swam along with us for a while. They were right beside the ship, and I was able to get a video of a few of them surfacing next to us. Many shark species, including the Atlantic Sharpnose shark, are viviparous, meaning they give birth to live young. These sharks form a placenta from the yolk sac while the embryo develops. While it is a common misconception that sharks do not get cancer, sharks have been found to get cancer, including chondromas. What type of cancer is that? Primary longline stations are indicated in purple. The red line represents the path the Oregon II. Each piece of equipment is pulled back aboard the boat in the same order that it was deployed into the water. 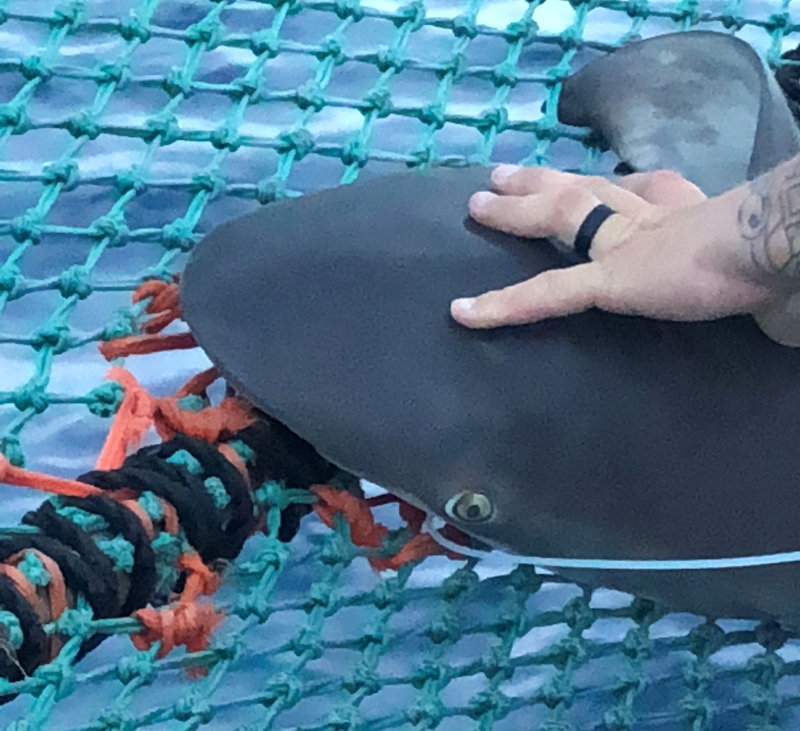 The numbered gangions are pulled up one by one and if there is a shark attached to the hook it is brought aboard for data collection. 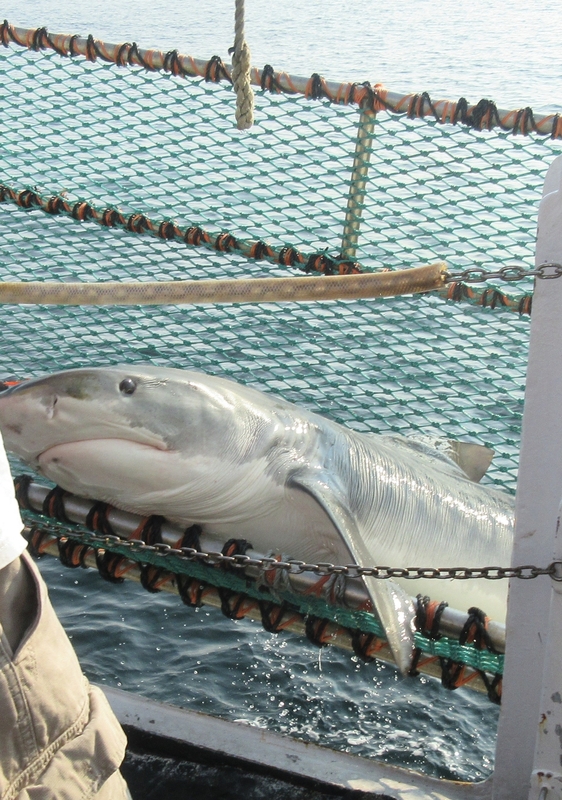 Larger sharks are brought up to the side of the vessel using a cradle. Precaudal Length: The length of the shark from the nose to the beginning of the caudal fin. Fork Length: The length of the shark from the nose to the fork of the caudal fin. Natural Length: The length of the shark from the nose to the end of the caudal fin as it naturally lies. Total Length: The length of the shark from the nose to the end of the caudal fin when stretched to its greatest length. #2 Weight: The weight of the shark is measured in kilograms. #3 M-Tag Number: An M-tag is inserted at the base of the dorsal fin, and it contains a specific number to identify the shark. #4 Roto Tag Number: Roto tags are used on smaller shark individuals, and are clipped to the center of the dorsal fin. Once all measurements are taken, and the shark has been tagged, it is released back into the water. Gulf Smooth-hound Shark (Mustelus sinusmexicanus) ready for release. I couldn’t have been placed on a better Teacher at Sea assignment. The entire NOAA team has been patient with me and willing to go out of their way to make sure I am enjoying my experience. 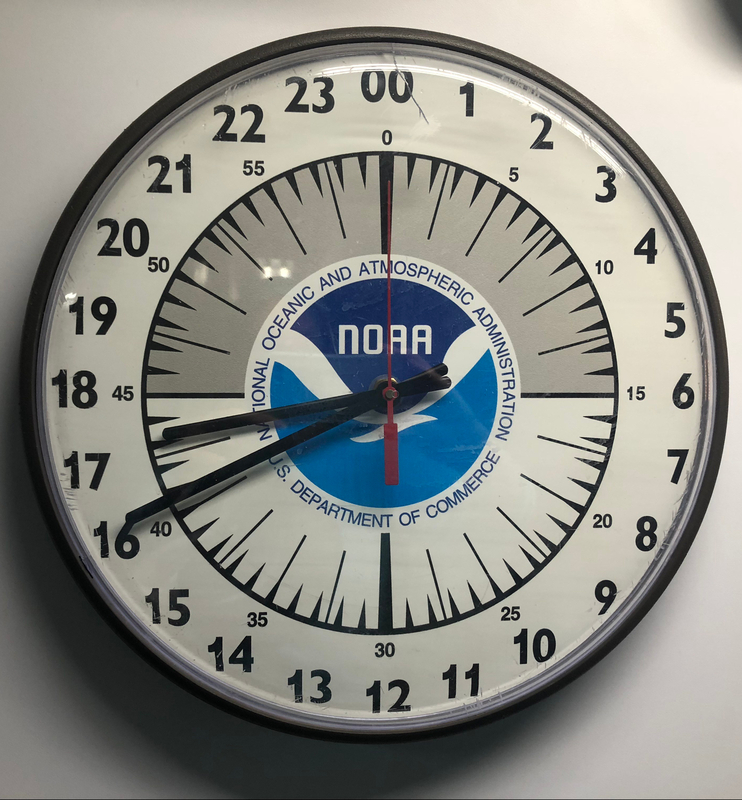 It is evident that the NOAA scientists are passionate about their work, as they are so eager to share every interesting detail no matter how small. “Shark On!” was the shout from the first person that sees a shark hooked to the long line that was being hauled up from the floor of the ocean. 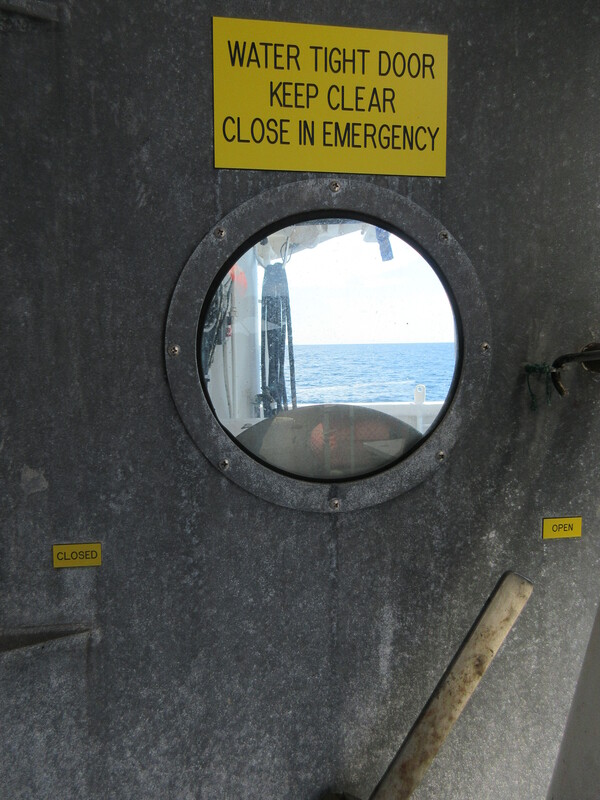 I heard this phrase often during the first leg of the long line Red Snapper/ shark survey on the NOAA ship Oregon II. We began fishing in the Northwest Atlantic Ocean, off the coast of West Palm Beach, Florida. We traveled north to Cape Hatteras, North Carolina, and back south to Port Canaveral over 12 days this summer. Oregon II scientific crew, Chief Boatswain, and skilled fishermen hauling in the long line. During our long line deployments each day, we were able to catch, measure, tag and photograph many sharks, before returning them to the ocean quickly and safely. During these surveys, we caught the species of sharks listed below, in addition to other interesting fish from the ocean. 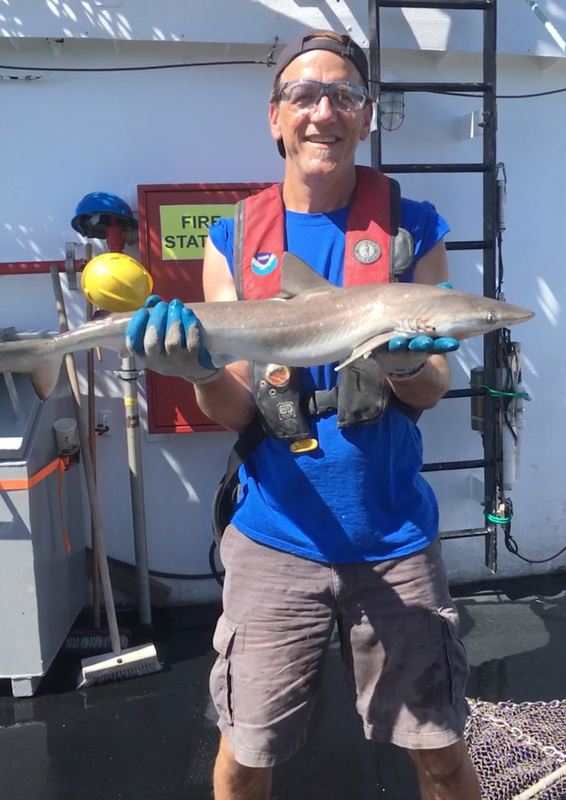 This blog has scientific information about each shark, and photographs taken by myself and other scientists on board the Oregon II. 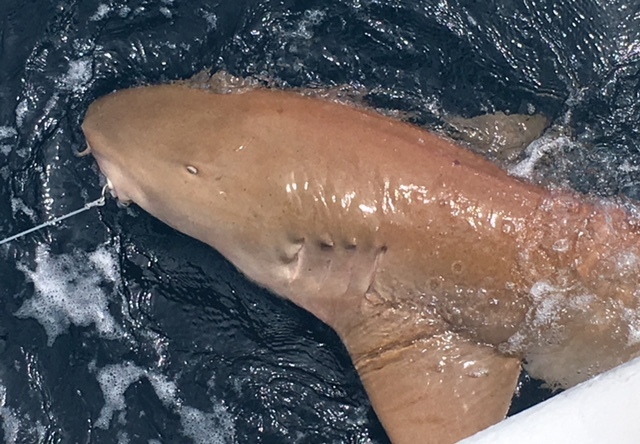 The following information on sharks, in addition to scientific data about hundreds of other marine wildlife can be found online at the NOAA Fisheries site: http://fisheries.noaa.gov. Great Hammerhead Shark- Sphyrna mokarran Hammerhead sharks are recognized by their long, strange hammer-like heads which are called cephalofoils. Great hammerheads are the largest species of hammerheads, and can grow to a length of 20 feet. The great hammerhead can be distinguished from other hammerheads as they have a much taller dorsal fin than other hammerheads. 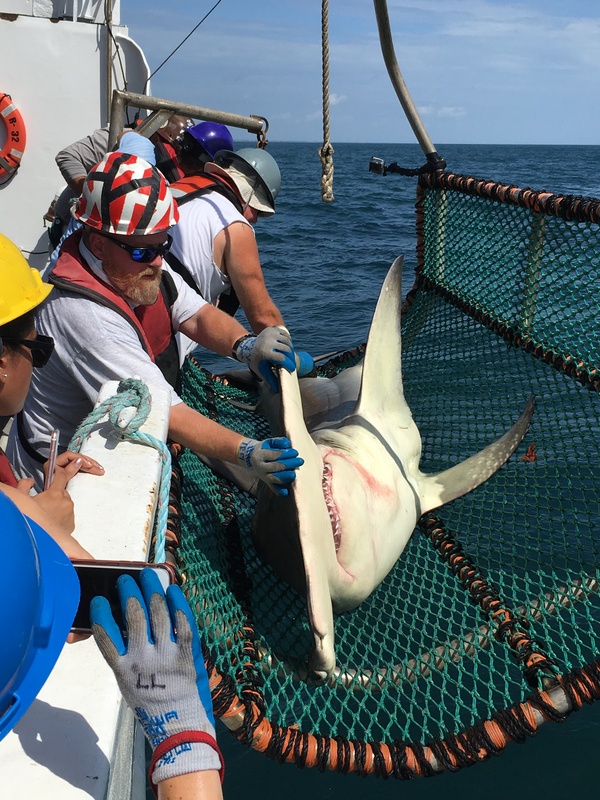 Great Hammerhead in cradle for data collection and return to sea. When moving through the ocean, they swing their broad heads from side to side and this motion provides them a much wider field of vision than other sharks. It provides them an all around view of their environment as their eyes are far apart at either end of the long hammers. They have only two small blind spots, in front of the snout, and behind the cephalofoil. Their wide heads also have many tiny pores, called ampullae of Lorenzini. They can sense tiny electric currents generated by fish or other prey in distress from far distances. Male Great Hammerhead 10. 5 ft. The great hammerhead are found in tropical and temperate waters worldwide, and inhabiting coastal areas in and around the continental shelf. They usually are solitary swimmers, and they eat prey ranging from crustaceans and squid, to a variety of bony fish, smaller sharks and stingrays. The great hammerhead can bear litters of up to 55 pups every two years. Nurse Shark- Ginglymostoma cirratum Nurse sharks are bottom dwellers. They spend their life in shallow water, near the sandy bottom, and their orangish- pinkish color and rough skin helps them camouflage them. At night they come out to hunt. Nurse sharks have short, serrated teeth that can eat through crustaceans such as crabs, urchins, shrimp, and lobsters. They also eat fish, squid, and stingrays. They have two feelers, or barbels, which hang from either side of their mouth. They use their barbels to search for prey in the sand. Their average adult size is 7.5- 9 feet in length and they weigh between 160-230 lbs. Adult females reach a larger size than the males at 7- 8.5 feet long and can weigh from 200-267 lbs. Nurse sharks are common in the coastal tropical waters of the Atlantic and also in the eastern Pacific Ocean. This species is locally very common in shallow waters throughout the Caribbean, south Florida to the Florida Keys. Large juveniles and adults are usually found around deeper reefs and rocky areas at depths of 10-250 feet during the daytime and migrate into shallower waters of less than 70 feet deep after dark. Juveniles up to 6 feet are generally found around shallow coral reefs, grass flats or mangrove islands in shallow water. They often lie in groups of forty on the ocean floor or under rock ledges. Nurse sharks show a preference for a certain resting site, and will repeatedly go back to to the same caves for shelter or rest after leaving the area to feed. Tiger Shark- Galeocerdo cuvier Adult Tiger sharks average between 10 -14 feet in length and weigh up to 1,400 lbs. The largest sharks can grow to 20 feet and weigh nearly 2,000 lbs. They mature between 5 and 10 years, and their life span is 30 years or more. Tiger sharks are named for the brown stripes and patches they have on their sides when they are young. As they get older, they stripes eventually fade away. They will eat almost anything they come across, and have been referred to as the “garbage cans of the sea”. Their habitat ranges from shallow coastal waters when they are young, to deep waters over 1,500 feet deep. They swim in shallow waters to hunt lobster, squid, fish, sea turtles, birds, and smaller sharks. They migrate with the seasons to follow prey and to give birth to young. They swim in cool waters in the summer, and in fall and winter they migrate to warm tropical waters. Their young grow in eggs inside the mother’s body and after 13 months the sharks hatch. The mother gives birth to a litter of 10 – 80 pups. Their current status is currently Near Threatened. TAS 2018 Stephen Kade returning sharpnose shark to ocean. Sharpnose Shark- Rhizoprionodon terraenovae Atlantic sharpnose sharks are small for sharks and have a streamlined body, and get their name from their long, pointy snout. They are several different shades of gray and have a white underside. Atlantic sharpnose sharks can grow to up to 32 inches in length. Atlantic sharpnose sharks have been observed to live up to 18 years. 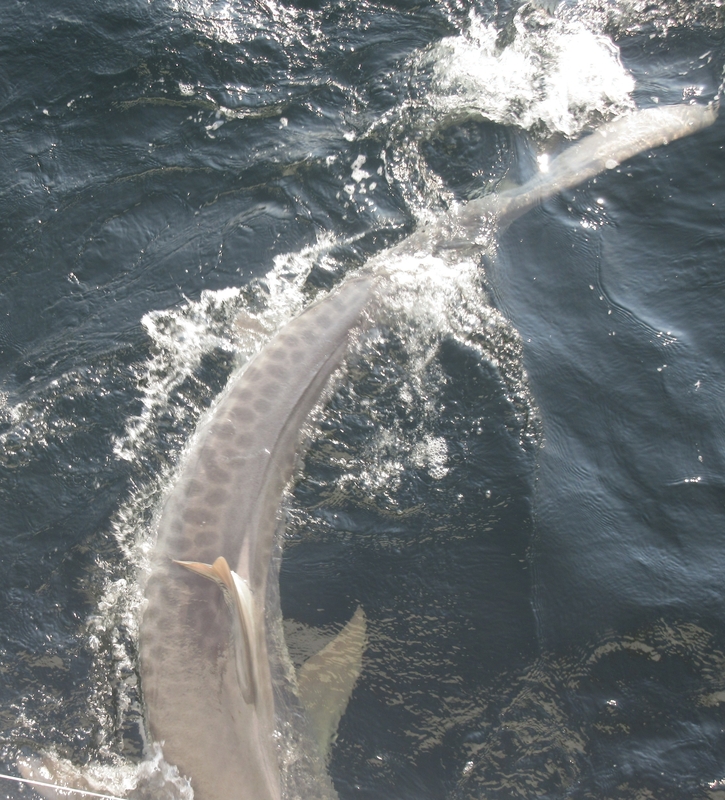 Females mature at around 2 years old in the Atlantic when they reach approximately 24 inches in length. Atlantic sharpnose sharks are commonly found in the western Atlantic from New Brunswick, Canada, right through the Gulf of Mexico. They are commonly caught in U.S. coastal waters from Virginia around to Texas. Atlantic sharpnose sharks eat small fish, including menhaden, eels, silversides, wrasses, jacks, toadfish, and filefish. The lower and upper jaws of an Atlantic sharpnose shark have 24 or 25 rows of triangular teeth. 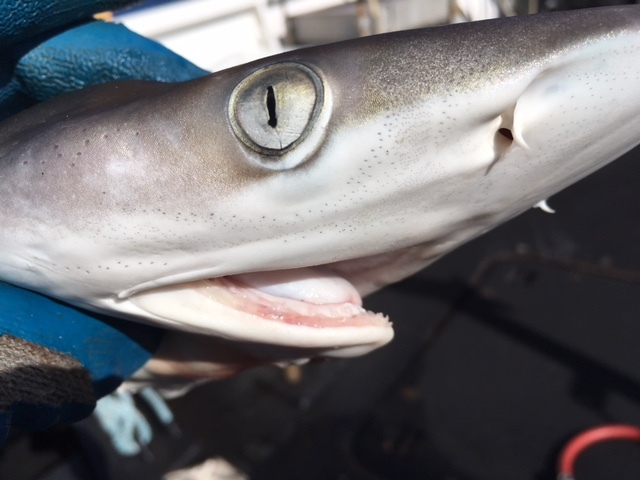 Atlantic sharpnose sharks mate annually between mid-May and mid-July in inshore waters, and after mating, they migrate offshore to deeper waters. They also eat worms, shrimp, crabs, and mollusks. Sandbar Shark- Carcharhinus plumbeus. The most distinctive feature of this stocky, grey shark is its huge pectoral fins, and long dorsal fin that increases its stability while swimming. Females can grow between 6 – 8.5 feet, and males grow up to 6ft. Its body color can vary from a blue to a light brown grey with a pale white underside. The sandbar shark lives in coastal waters, living in water that is 20 to 200 feet deep. Rarely is its large dorsal fin seen above the water’s surface, as the sandbars prefer to remain near the bottom. It commonly lives in harbors, lagoons, muddy and sandy bays, and river mouths, but never moves into freshwater. The sandbar shark lives in warm and tropical waters in various parts of the world including in the Western Atlantic, from Massachusetts down to southern Brazil. Sandbar shark tagged, measured, weighed and ready to go back after photo. The sandbar shark spends the majority of its time near the ocean floor, where it looks continuously for prey, such as small fish, mollusks, and various crustaceans. Their main diet consists largely of fish. Sandbar sharks give birth to between 1 and 14 pups in each litter. The size of the litter depends on the size of the mother, with large females giving birth to larger litters. Pregnancy is estimated to last between 8- 12 months. Females move near shore to shallow nursery areas to give birth. The females leave coastal areas after giving birth, while the young remain in the nursery grounds until winter, when they move into warmer and deeper water. Fun Fact- Remoras, or shark suckers, live in tropical oceans around the world. They have a rigid oval- shaped sucker pad on top of their head that it uses to attach itself to sharks and rays. It is symbiotic relationship where both animals gain something from their temporary union. Remoras mouths are at the top front of the body so while attached to a shark’s body, they do their host a favor by nibbling off skin parasites. They can also eat scraps of leftover food the shark leaves behind while they also enjoy a free ride. The shark gains a day at the spa for a body scrub, and can rid itself of parasites in a way it couldn’t have before! It was certainly an unforgettable experience being able to work with the scientific and fishing team for this shark survey. The opportunity to see and handle these sharks up close for two weeks has informed me of so many interesting things about these wonderful and vital members of the ocean. I can now take this information and share it first hand with students in my classroom, and members of my community. I also want to work to bring a positive awareness to these vital members of the ocean food web so they can thrive well into the future. As an artist, this trip has been invaluable for me, as now I’ve seen the how colorful and varied sharks are and other various anatomy details you just can’t see in books or television. This new awareness will help to make my future paintings more accurate than before. Before getting into the technology that allows the scientific work to be completed, it’s important to mention the science and technology that make daily life on the ship safer, easier, and more convenient. Electricity powers everything from the powerful deck lights used for working at night to the vital navigation equipment on the bridge (main control and navigation center). Whether it makes things safer or more efficient, the work we’re doing would not be possible without power. Just in case, several digital devices have an analog (non-electronic) counterpart as a back-up, particularly those used for navigation, such as the magnetic compass. To keep things cool, large freezers are used for storing bait, preserving scientific samples, and even storing ice cream (no chumsicles for dessert—they’re not all stored in the same freezer!). After one particularly sweltering shift, I was able to cool off with some frozen coffee milk (I improvised with cold coffee, ice cream, and milk). More importantly, without the freezers, the scientific samples we’re collecting wouldn’t last long enough to be studied further back at the lab on land. Electricity also makes life at sea more convenient, comfortable, and even entertaining. We have access to many of the same devices, conveniences, and appliances we have at home: laundry machines, warm showers, air conditioning, home cooked meals, a coffee maker, TVs, computers with Wi-Fi, and special phones that allow calls to and from sea. A large collection of current movies is available in the lounge. 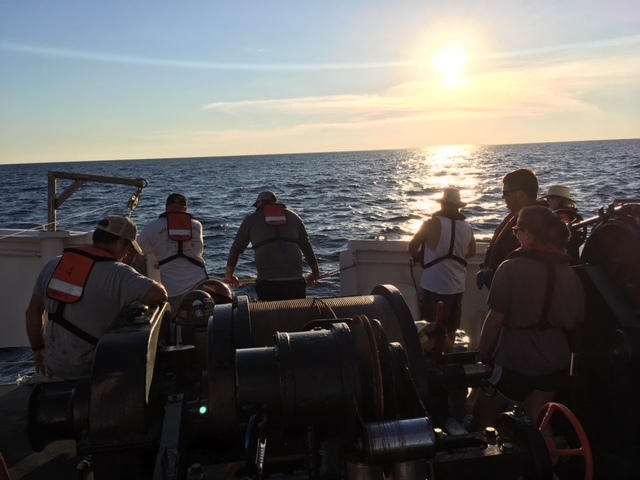 During my downtime, I’ve been writing, exploring, enjoying the water, and learning more about the various NOAA careers on board. To use my computer, I first needed to meet with Roy Toliver, Chief Electronics Technician, and connect to the ship’s Wi-Fi. While meeting with him, I asked about some of the devices I’d seen up on the flying bridge, the top deck of the ship. The modern conveniences on board are connected to several antennae, and Roy explained that I was looking at important navigation and communication equipment such as the ship’s GPS (Global Positioning System), radar, satellite, and weather instrumentation. The weather devices on top are called anemometers, and they measure true wind speed and direction relative to the ship’s speed and direction. The term comes from the Greek word ‘anemos,’ which means wind. On the right is the fishing day shape, indicating to nearby ships that the Oregon II is using fishing gear. These satellites help to provide the television and internet on the ship. I was also intrigued by the net-like item (called a Day Shape) that communicates to other ships that we are deploying fishing equipment. This lets nearby ships know that the Oregon II has restricted maneuverability when the gear is in the water. At night, lights are used to communicate to other ships. Communication is crucial for safety at sea. A dissolved oxygen sensor to be mounted on the environmental profiler, which collects environmental data through the water column. A CTD refers to several electronic instruments that measure conductivity, temperature, depth, and other properties in the water column. Scientists are interested in changes in these properties relative to depth. Without accurate sensors, it’s very difficult for the scientists to get the data they need. If the sensors are not working or calibrated correctly, the information collected could be inaccurate or not register at all. The combination of salt water and electronics poses many interesting problems and solutions. I noticed that several electronic devices, such as computers and cameras, are built for outdoor use or housed in durable plastic cases. Chief Electronics Technician Roy Toliver in his office on the Oregon II. The office is like the ship’s computer lab. When he’s not working on the ship’s electronics, Roy enjoys reading out on the stern. It’s a great place for fresh air, beautiful views, and a good book! Preparing and packing for my time on the Oregon II reminded me of The Oregon Trail video game. How to pack for a lengthy journey to the unfamiliar and unknown? I had a hard time finding bib overalls and deck boots at the general store. I didn’t want to run out of toiletries or over pack, so before leaving home, I tracked how many uses I could get out of a travel-sized tube of toothpaste, shampoo bottle, and bar of soap, and that helped me to ration out how much to bring for fifteen days (with a few extras, just in case). 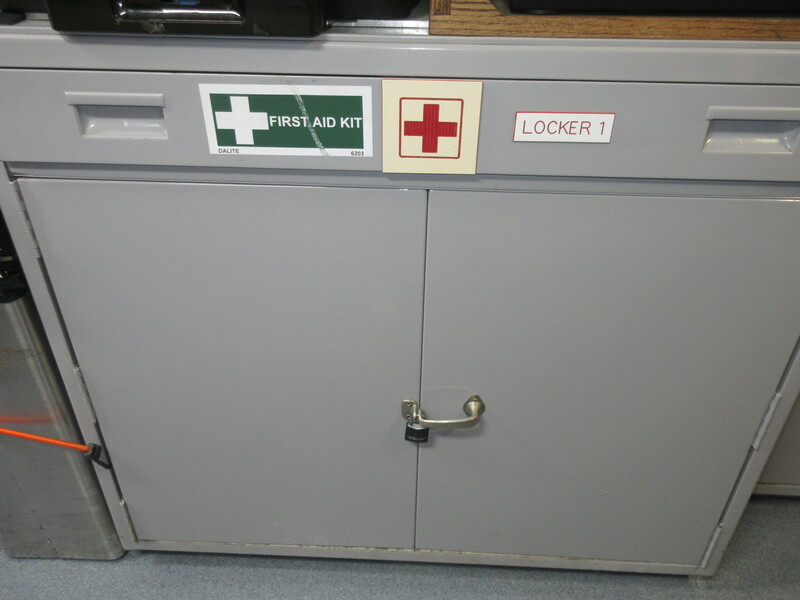 The scientists and crew of the Oregon II also have to plan, prepare, and pack all of their food, clothing, supplies, tools, and equipment carefully. Unlike The Oregon Trail game, I didn’t need oxen for my journey, but I needed some special gear: deck boots, foul weather gear (rain jacket with a hood and bib overalls), polarized sunglasses (to protect my eyes by reducing the sun’s glare on the water), lots of potent sunscreen, and other items to make my time at sea safe and comfortable. I was able to anticipate what I might need to make this a more efficient, comfortable experience, and my maritime instincts were accurate. Mesh packing cubes and small plastic baskets help to organize my drawers and shower items, making it easier to find things quickly in an unfamiliar setting. This is where we sleep in the stateroom. The blue curtains can be closed to darken the room when sleeping during the day. On the left is a sink. Reading and dreaming about sharks! Dirt, guts, slime, and grime are part of the job. A bar of scrubby lemon soap takes off any leftover sunscreen, grime, or oceanic odors that leaked through my gloves. Little things like that make ship life pleasant. Not worrying about how I look is freeing, and I enjoy moving about the ship, being physically active. It reminds me of the summers I spent as a camp counselor working in the woods. The grubbier and more worn out I was, the more fun we were having. The NOAA Corps is a uniformed service, so the officers wear their uniforms while on duty. For everyone else, old clothes are the uniform around here because the work is often messy, dirty, and sweaty. With tiny holes, frayed seams, mystery stains, cutoff sleeves, and nautical imagery, I am intrigued by the faded t-shirts from long-ago surveys and previous sailing adventures. Some of the shirts date back several years. The well-worn, faded fabric reveals the owner’s experience at sea and history with the ship. The shirts almost seem to have sea stories to tell of their own. As we sail, the view is always changing and always interesting! 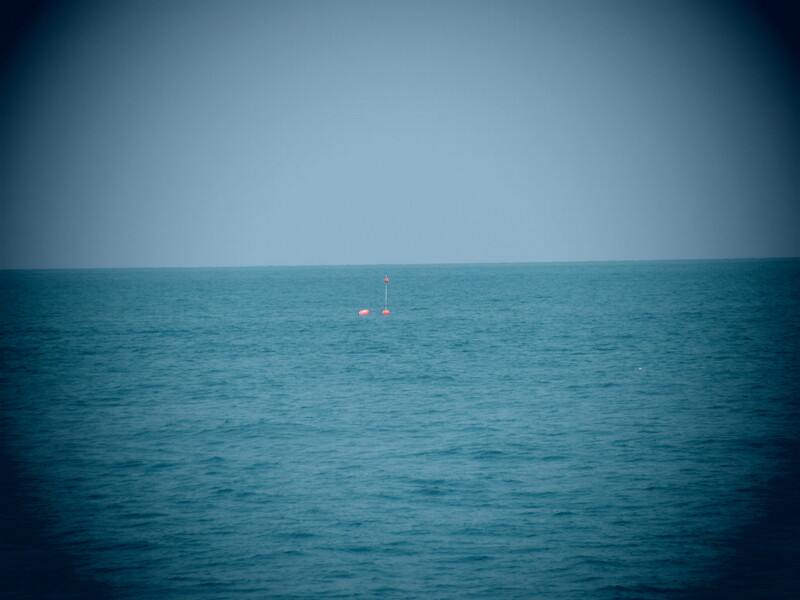 Being at sea is a very natural feeling for me, and I haven’t experienced any seasickness. One thing I didn’t fully expect: being cold at night. The inside of the ship is air-conditioned, which provides refreshing relief from the scorching sun outside. I expected cooler temperatures at night, so I brought some lightweight sweatshirts and an extra wool blanket from home. On my first night, I didn’t realize that I could control the temperature in my stateroom, so I shivered all night long. It’s heavy, tough, and grey, but it’s not a shark! My preparing and packing didn’t end once I embarked (got on) on the ship. Every day, I have to think ahead, plan, and make sure I have everything I need before I start my day. This may seem like the least interesting aspect of my day, but it was the biggest adjustment at first. Your roommate is sleeping while you’re working (and vice versa), so you need to be quiet and respectful of their sleep schedule. That means you need to gather anything you may need for the day (or night, if you’re assigned to the night watch), and bring it with you. No going back into the room while your roommate is getting some much-needed rest. Land is not in sight, so everything you need must be on the ship. Going to the store is not an option. Just some of the items in my backpack: sunscreen, sunglasses, a hat, sweatshirt, a water bottle, my camera, my phone, my computer, chargers for my electronics, an extra shirt, extra socks, snacks, etc. I am assigned to the day watch, so my work shift is from noon-midnight. During those hours, I am a member of the science team. 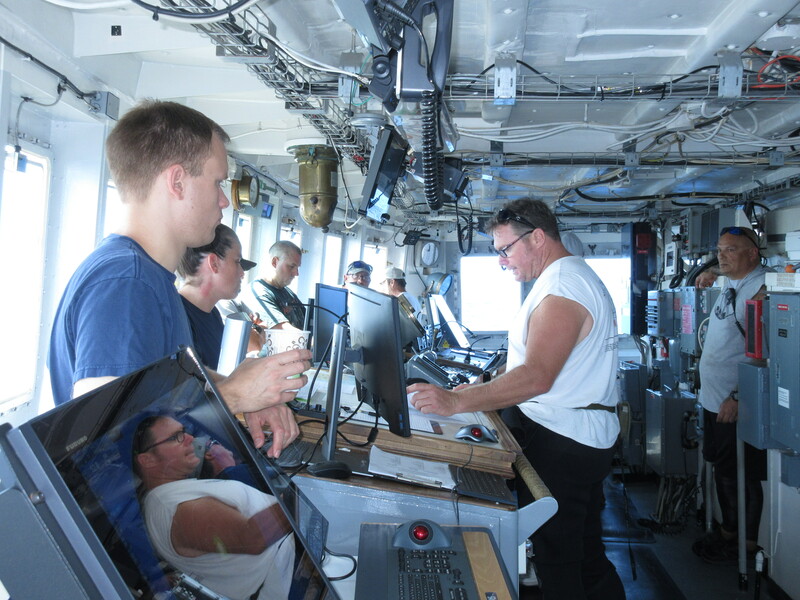 While on the day watch, the five of us rotate roles and responsibilities, and we work closely with the deck crew to complete our tasks. 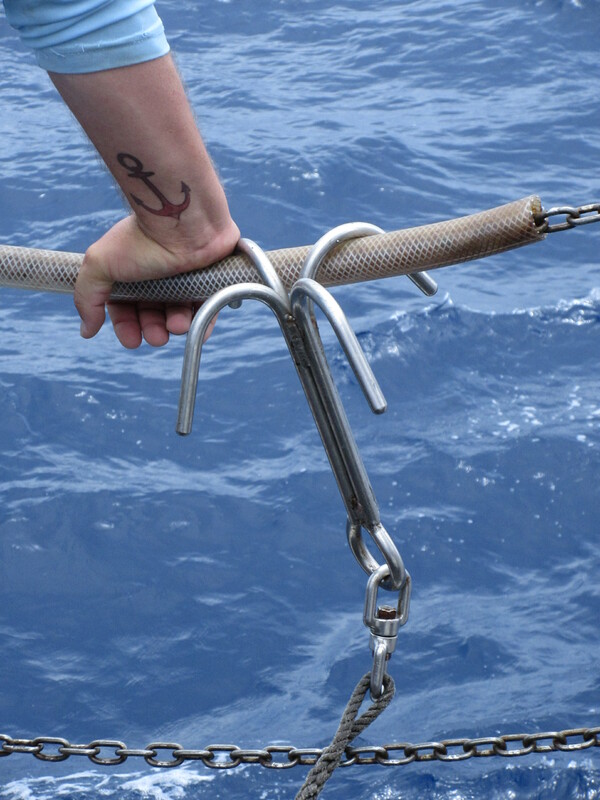 The deck department is responsible for rigging and handling the heavier equipment needed for fishing and sampling the water: the monofilament (thick, strong fishing line made from plastic), cranes and winches for lifting the CTD, and the cradle used for safely bringing up larger, heavier sharks. 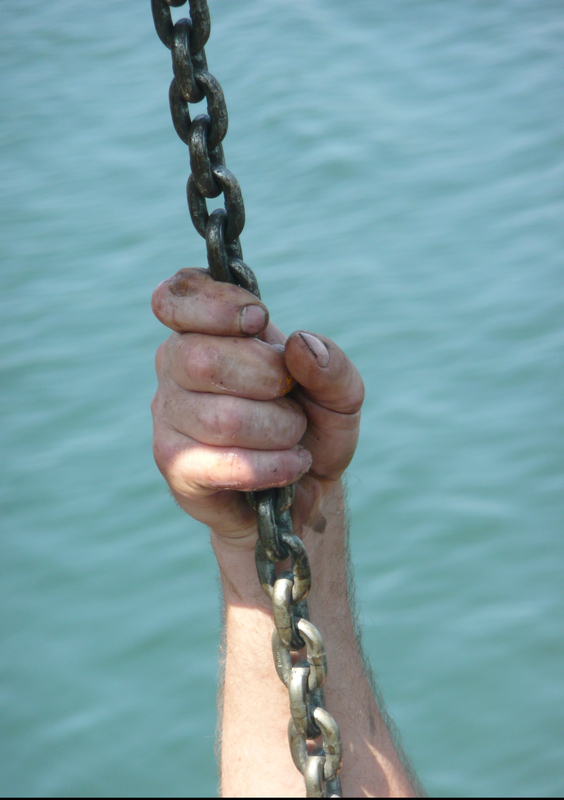 In addition to keeping the ship running smoothly and safely, they also deploy and retrieve the longline gear. Pulleys, winches, and cranes are found throughout the boat. Another adjustment has been learning the routines, procedures, and equipment. For the first week, it’s been a daily game of What-Am-I-Looking-At? as I try to decipher and comprehend the various monitors displayed throughout the ship. I follow this with a regular round of Now-What-Did-I-Forget? as I attempt to finesse my daily hygiene routine. The showers and bathroom (on a ship, it’s called the head) are down the hall from my shared stateroom, and so far, I’ve managed to forget my socks (day one), towel (day two), and an entire change of clothes (day four). With the unfamiliar setting and routine, it’s easy to forget something, and I’m often showering very late at night after a long day of work. I’m more than ready to cool off and clean up after my shift. One thing I never forget? Water. I am surrounded by glittering, glistening water or pitch-black water; water that churns and swells and soothingly rocks the ship. Swirling water that sometimes looks like ink or teal or indigo or navy, depending on the conditions and time of day. Another thing I’ll never forget? This experience. In case I forget, the heat of the sun reminds me to drink water all day long. The Gulf of Mexico is home to five species, or types, or sea turtles: Leatherback, Loggerhead, Green, Hawksbill, and Kemp’s Ridley. Many of my students have never seen or experienced the ocean. To make the ocean more relevant and relatable to their environment, I recommend the picture book Skyfishing written by Gideon Sterer and illustrated by Poly Bernatene. A young girl’s grandfather moves to the city and notices there’s nowhere to fish. She and her grandfather imagine fishing from their high-rise apartment fire escape. The “fish” they catch are inspired by the vibrant ecosystem around them: the citizens and bustling activity in an urban environment. The catch of the day: “Flying Litterfish,” “Laundry Eels,” a “Constructionfish,” and many others, all inspired by the sights and sounds of the busy city around them. The book could be used to make abstract, geographically far away concepts, such as coral ecosystems, more relatable for students in urban, suburban, and rural settings, or as a way for students in rural settings to learn more about urban communities. The young girl’s observations and imagination could spark a discussion about how prominent traits influence species’ common names, identification, and scientific naming conventions.